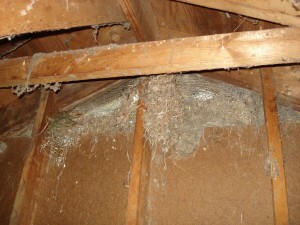 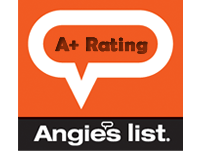 Photos | Lexington KY Home Inspections | Bain Property Inspection, Inc. 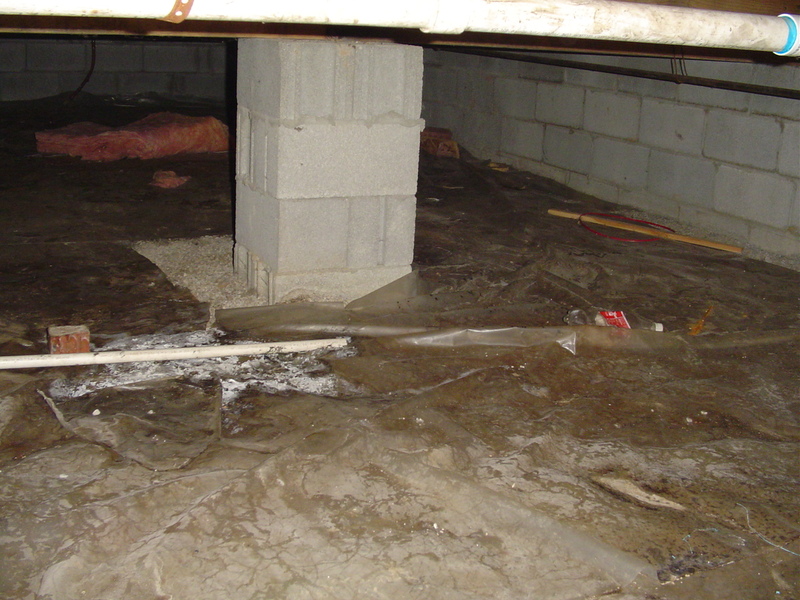 The photos below are by no means comprehensive, but they’ll give you an idea of what we look for and also the kinds of deficiencies we discover while checking out houses and buildings. 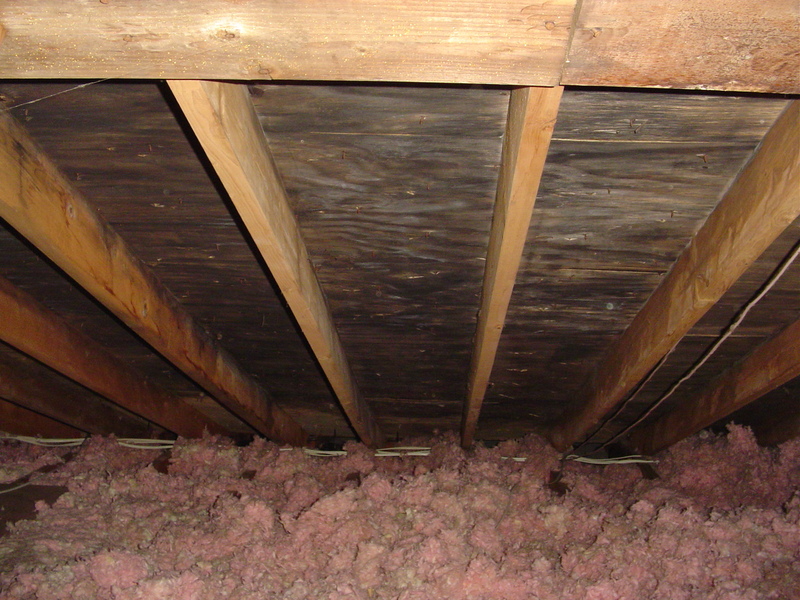 We also want you to realize that we attempt to physically observe as much of a structure as is safely possible, including roofs, attics and crawlspaces. 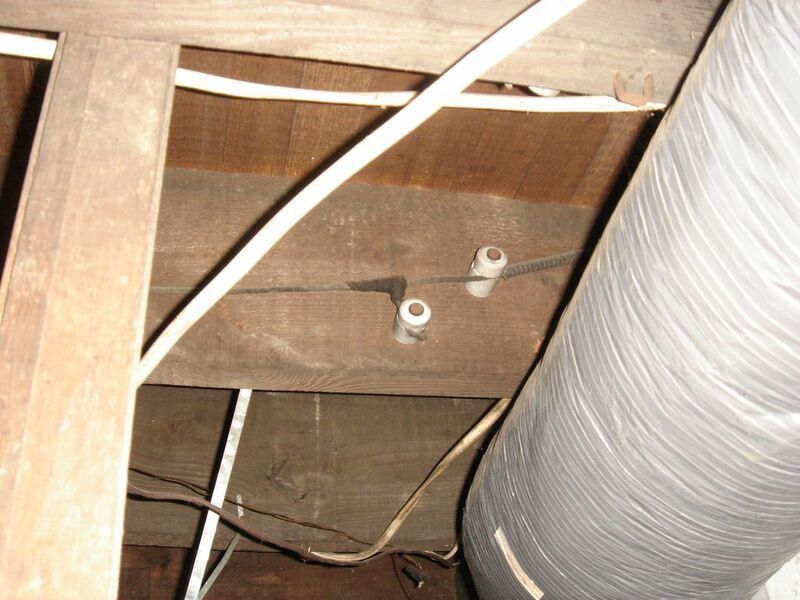 My inspection reports contain photos similar to the ones below, and every photo is annotated so my clients understand the problems they’re seeing. 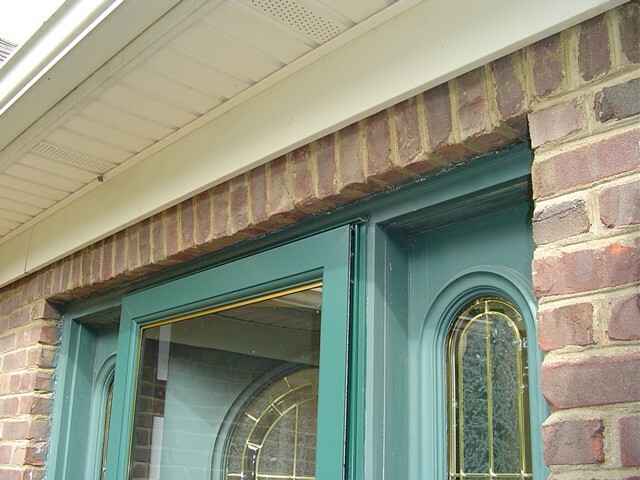 I’ve found that this approach is tremendously helpful for clients who aren’t accustomed to reading home- or building-inspection reports. 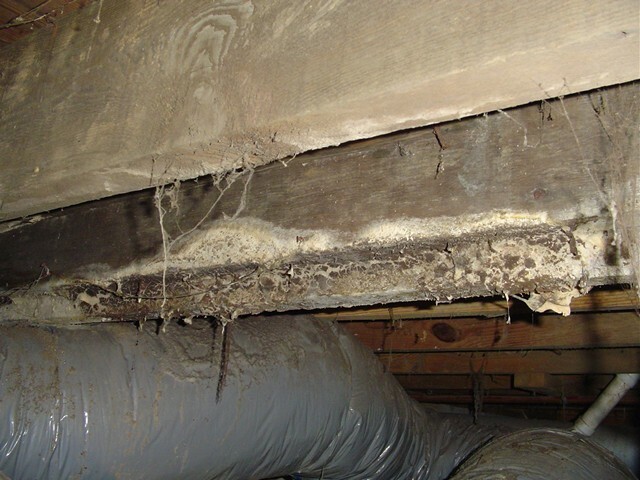 Because of this, I often take as many as forty or fifty photos for a home inspection, and sometimes twice that many for a commercial-building inspection. 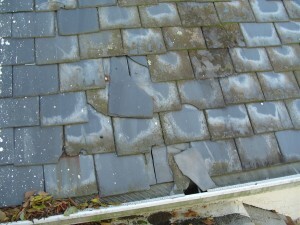 This roof has failed, and must be replaced. 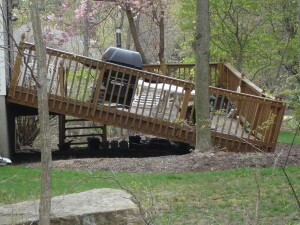 The extent of damage wasn't evident from the ground. 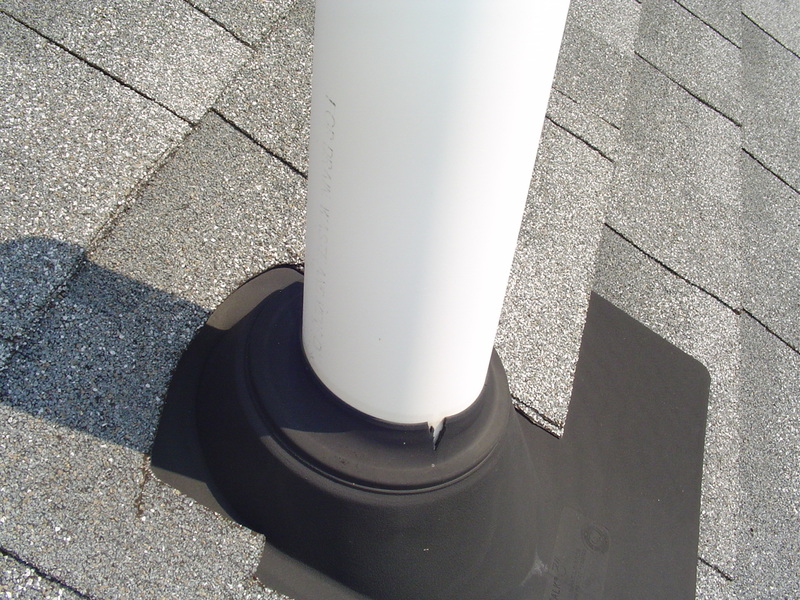 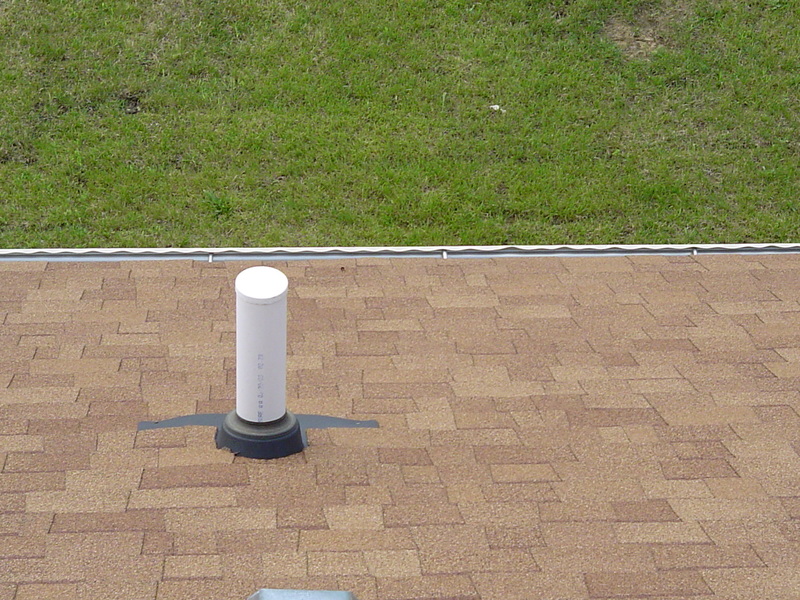 The neoprene flashing boot beneath this sewer vent has cracked and must be replaced. Water is currently leaking into the attic. 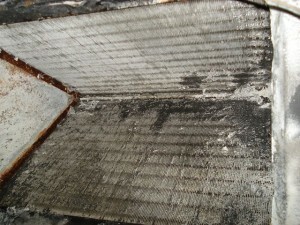 Missing flashings are common deficiencies. In this photo, you can see appropriate flashings where the front-porch roof abuts the brick veneer, however there are no flashings within the cornice returns on the front of the porch. When flashings are missing, rainwater can seep between the shingles and the brick veneer, and damage the underlying wooden-decking. This slate roof has multiple cracked and partially-detached shingles. 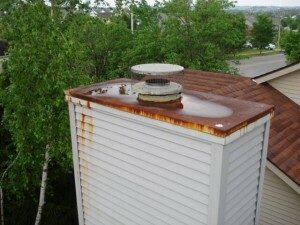 The zinc coating on this galvanized chimney cap has eroded away, and the cap is severely rusted and needs to be replaced, as a result. 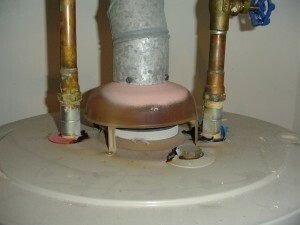 Note, too, that the cap is concave. 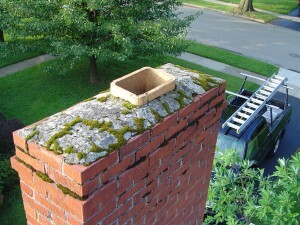 It's probably allowing rainwater to seep into the chimney housing. 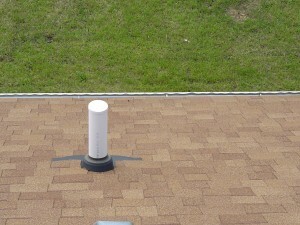 The test cap was never removed from this sewer vent. 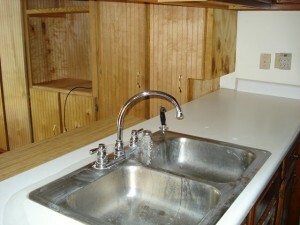 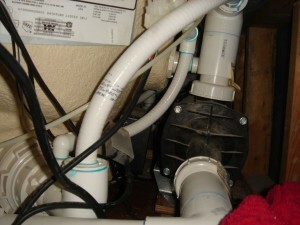 The plumbing drains in this house weren't functioning correctly due to vacuums within the DWV (Drain/Waste/Vent) system. 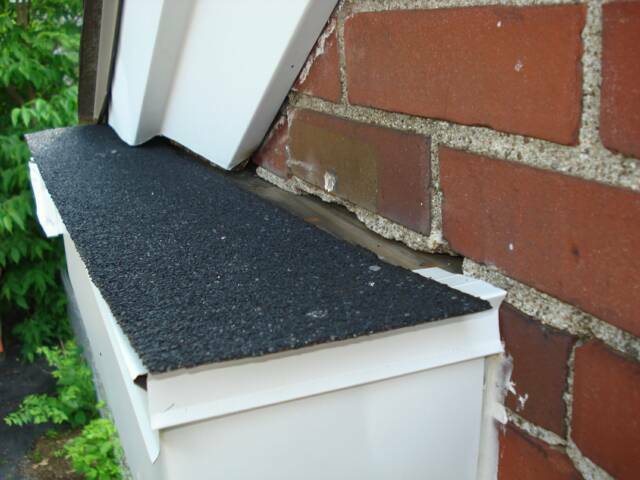 There is no flashing whatsoever where the asphalt roll-roofing abuts the brick veneer. 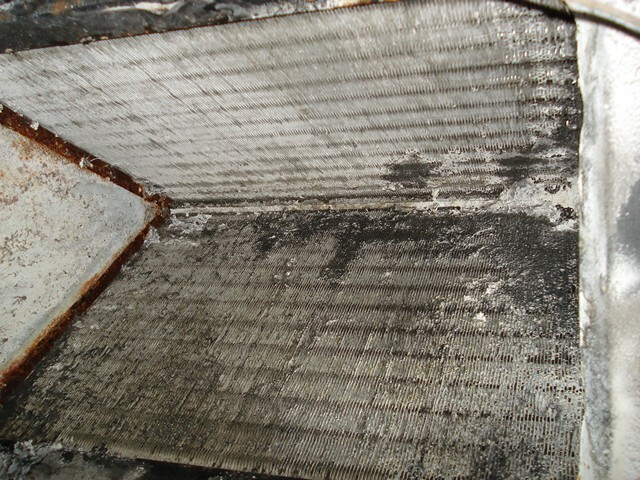 Note the exposed, and water damaged, roof decking. 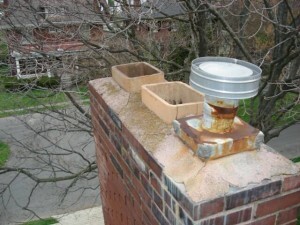 This chimney crown is sorely in need of repairs, the terra-cotta flue liners are cracked, and the gas-appliance flue-pipe isn't drafting correctly. 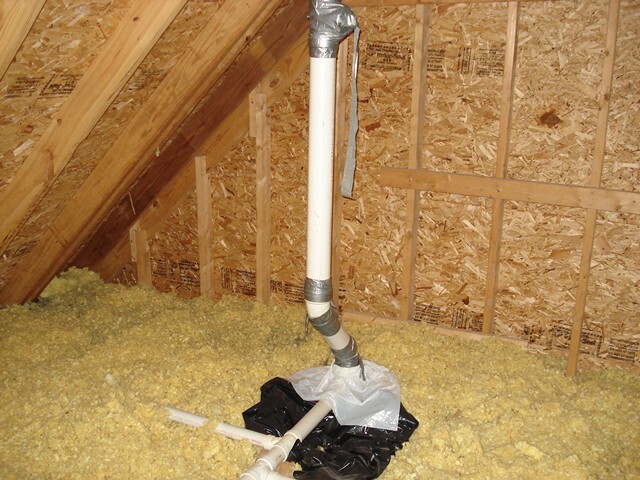 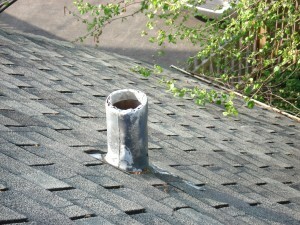 Squirrels often gnaw on lead flashings with which sewer vents are wrapped, which leads to leakage into attics. 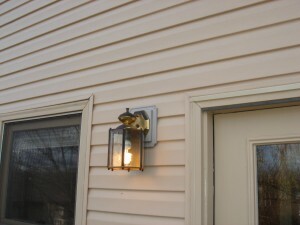 This flashing needs to be replaced. 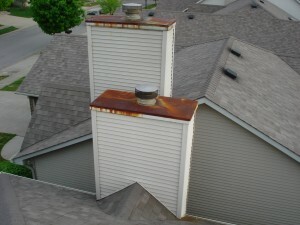 Here are two more failed, galvanized chimney caps. 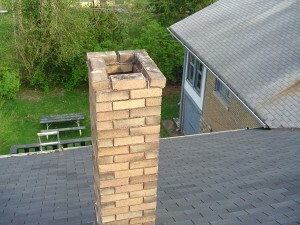 This chimney isn't lined, which renders it unsuitable for burning wood. Its deterioration is being exacerbated by the lack of a cap and/or spark arrestor. 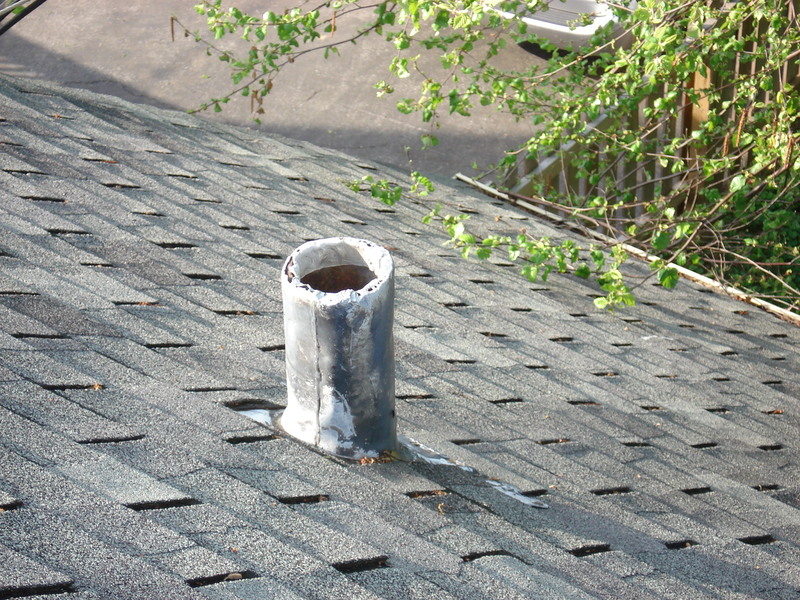 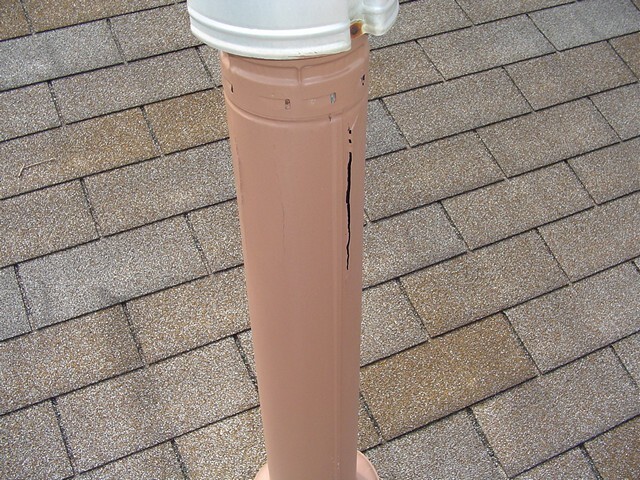 Though not specifically roof-related, when the roof is walked, damaged flue-pipes like this one are readily apparent. 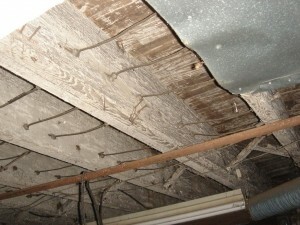 This beam (or girder) is inadequately supported by dry-stacked blocks and random pieces of wood. New piers have to be installed. There is no lintel above this door to support the brick veneer above it. 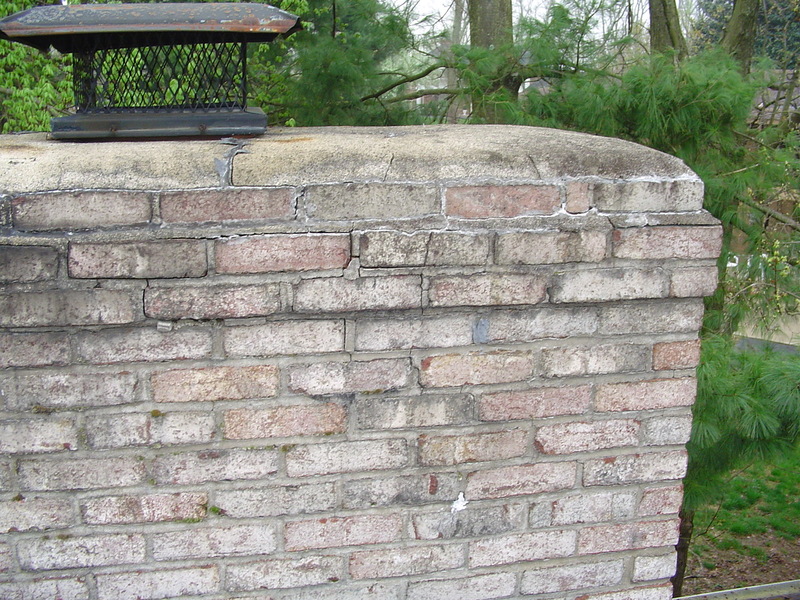 The wooden door frame is all that's holding the brick in place. 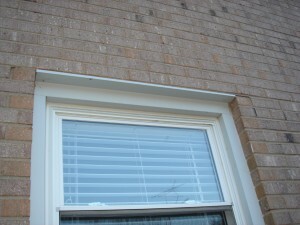 An appropriate lintel must be installed. 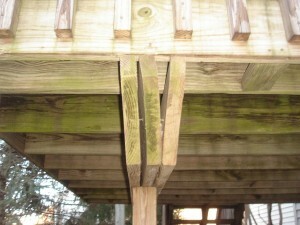 The pier for this deck is inadequately fastened to the floor system. 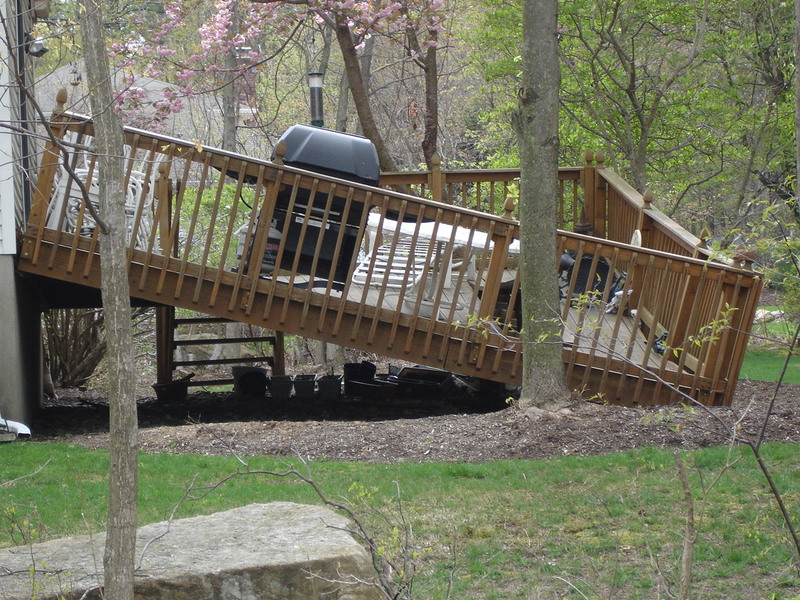 The pier could easily displace and allow the deck to collapse. This steel pier isn't positively anchored to the ground at its lower end to prevent uplift and lateral displacement, as required. 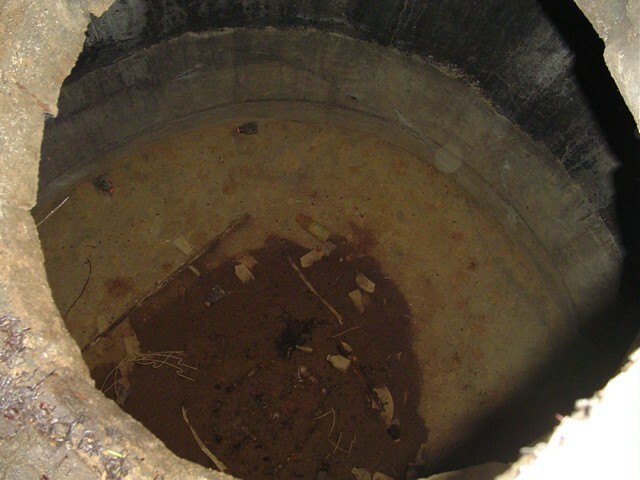 Some houses have cisterns that typically have been abandoned. Cisterns, or more specifically their lids, have been known to collapse. 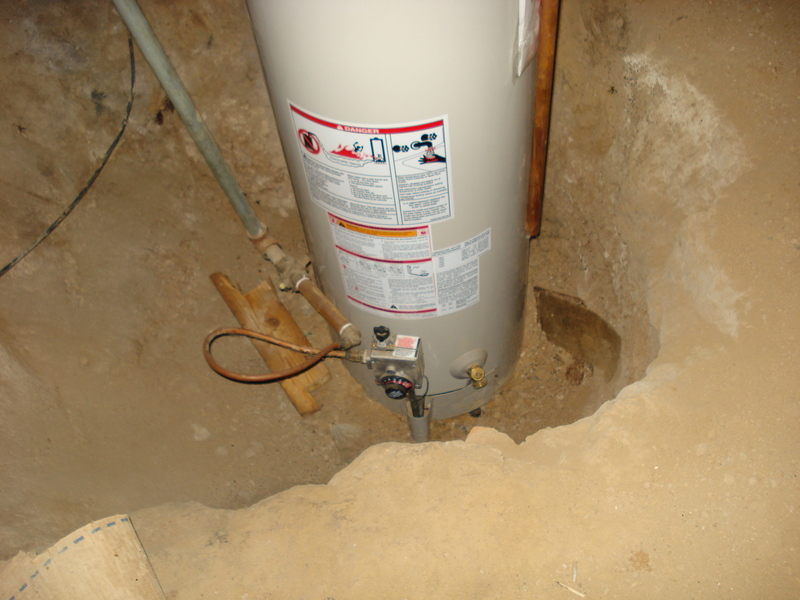 I typically recommend filling cisterns like this one with gravel. 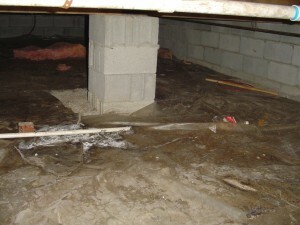 It's exceedingly common to find water damaged--and in this instance mold covered--floor framing beneath exterior doors. This section of sub-floor must be replaced. 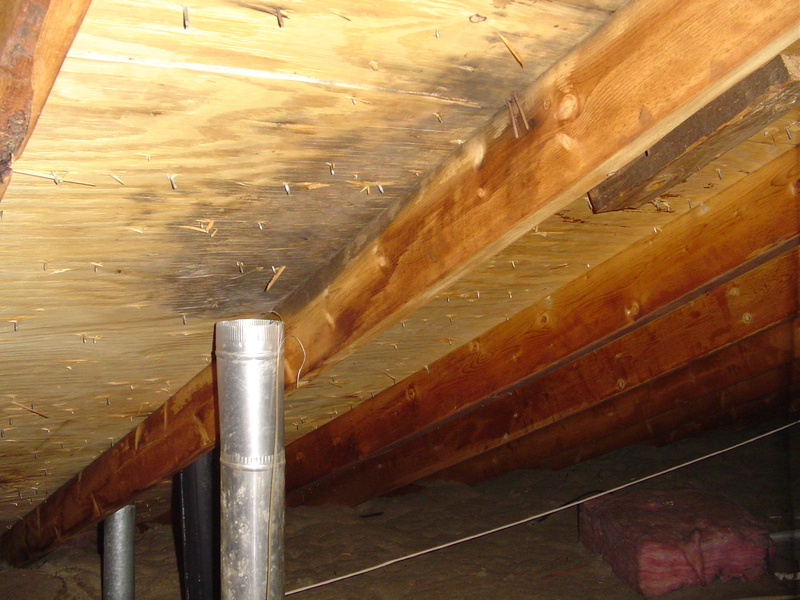 Roof trusses require lateral bracing to prevent them from racking. Framing contractors often neglect to install lateral bracing, which prompted manufacturers to place tags like this one on their products. 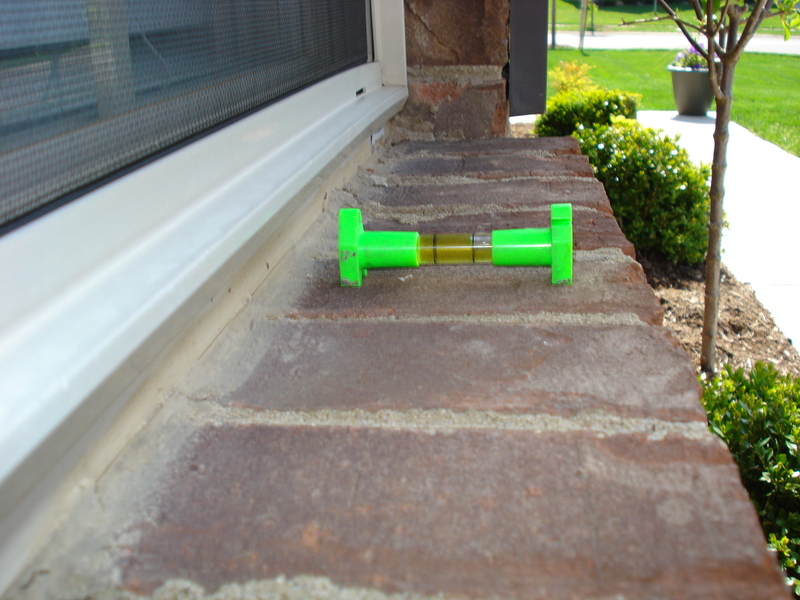 Brick rowlocks beneath windows are required to slope a minimum of fifteen-degrees away from structures to properly shed water. 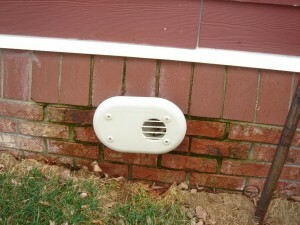 This rowlock is incorrectly sloped toward the house, and is allowing water to enter the wall assembly. 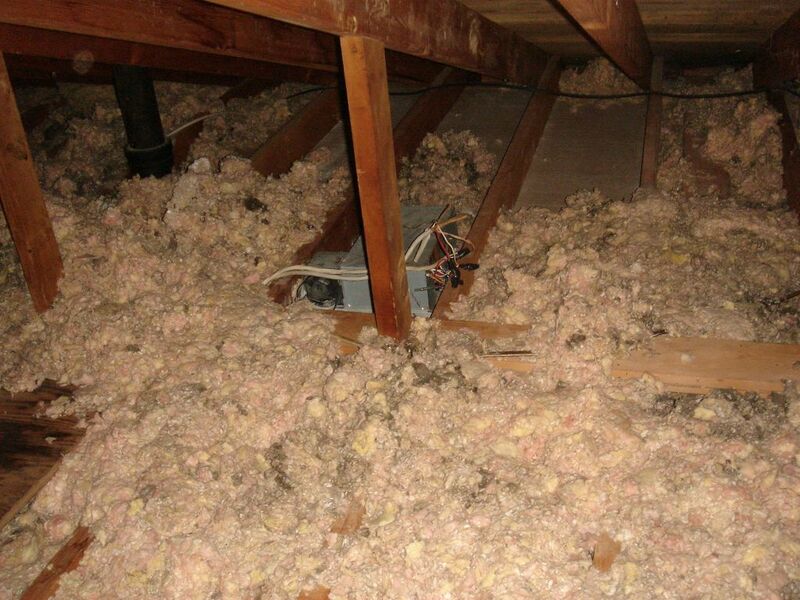 This floor framing is covered with poria incrassata, a wood-destroying fungus. 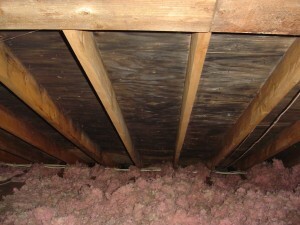 Extensive reinforcement, as well as elimination of water in the crawlspace, is necessary. 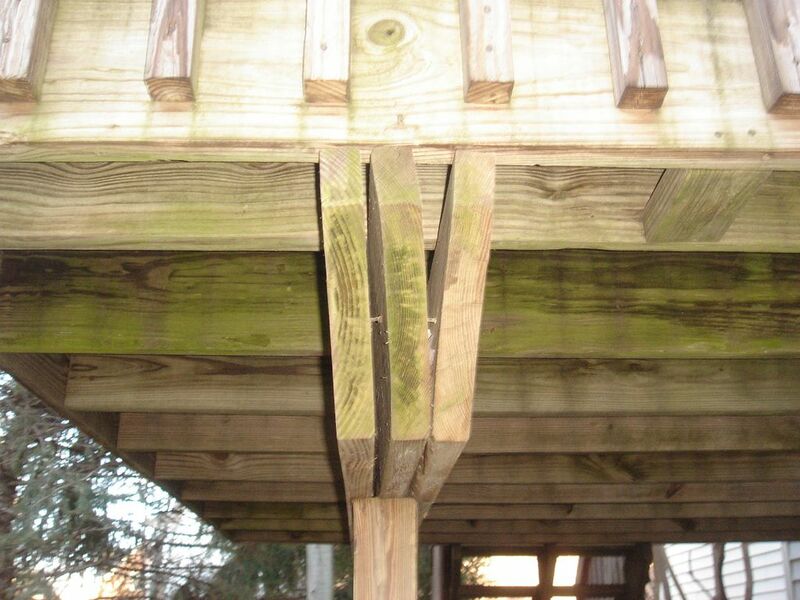 This deck collapsed due to inadequate fastening of the floor system to the pier. 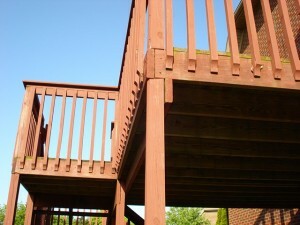 Thankfully, the deck wasn't too awfully far above grade. 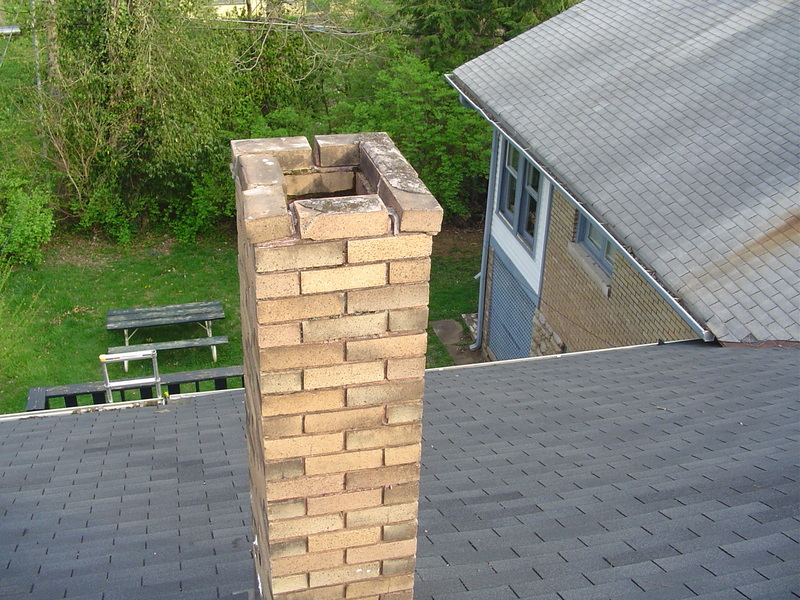 This chimney has failed and requires reconstruction. 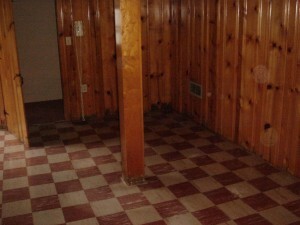 This water damaged sub-floor is covered with mold and requires replacement. 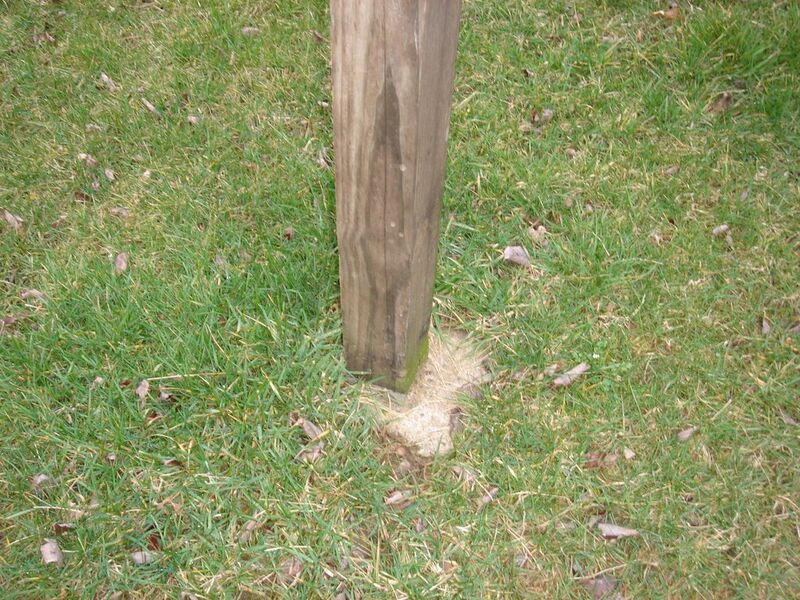 The beam for this pier was inadequately fastened with nails, whereas carriage bolts or lag screws should have been used. The beam could have easily displaced. 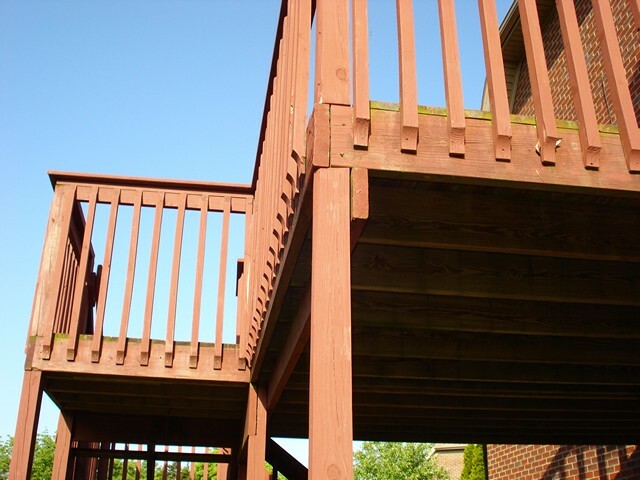 Exterior-deck piers are also required to be anchored at their lower ends to prevent lateral displacement. 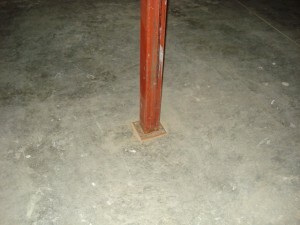 The footer beneath this pier is also undersized, and doesn't extend below the frostline. The boards that comprise the beam beneath this deck are inadequately fastened, and the boards aren't serving as a single, structural support. 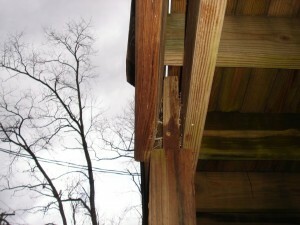 Also, the beam isn't well fastened to the pier, and is in danger of displacing. 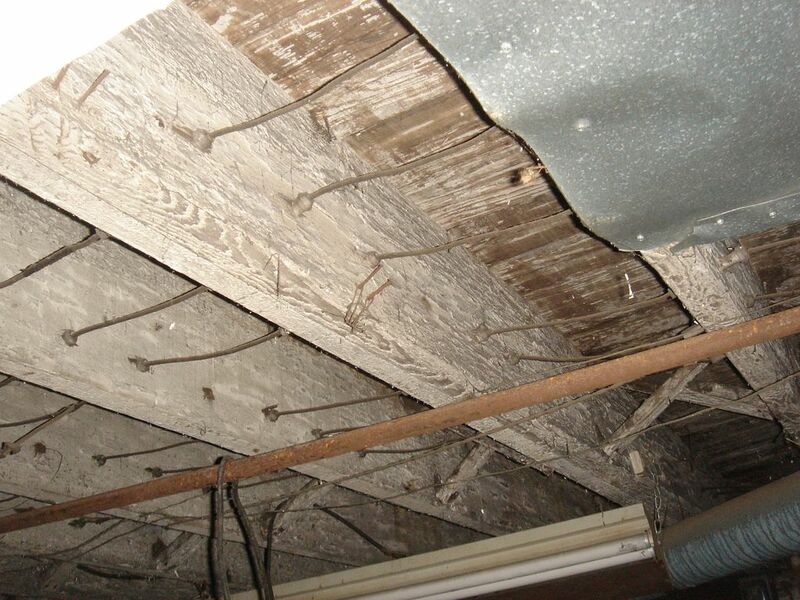 The EPA has issued a bulletin warning that all 9" x 9" floor tiles should be treated as if they asbestos until appropriate testing is performed by an accredited laboratory. 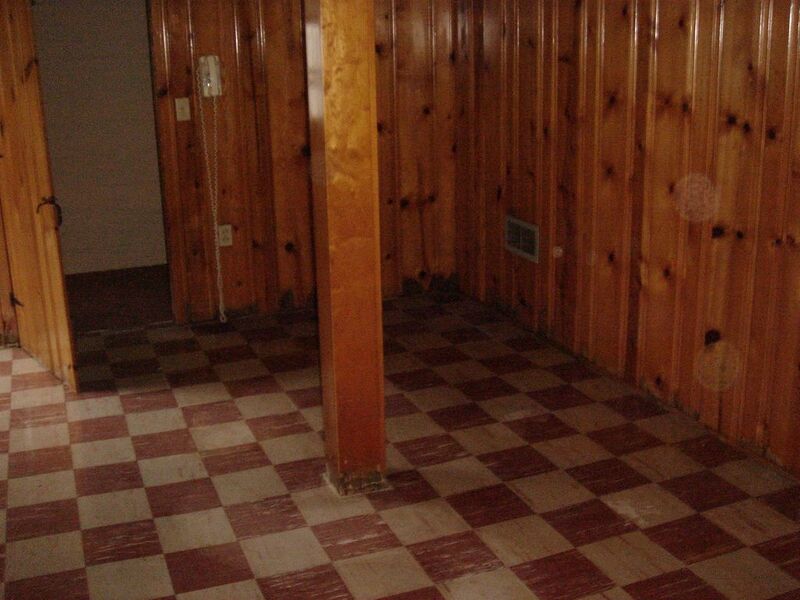 These floor tiles likely contain asbestos. Wire splices must be placed in appropriate junction boxes, and not merely be wrapped with tape. 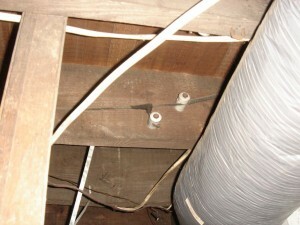 Here is another example of exposed wire connectors that could potentially shock someone or cause a fire. The bathroom fan, of course, is supposed to discharge to the exterior of the house rather than into the attic. These photo-electrical garage-door safety sensors are inanely installed above the opener mechanism, rather than beneath the door. 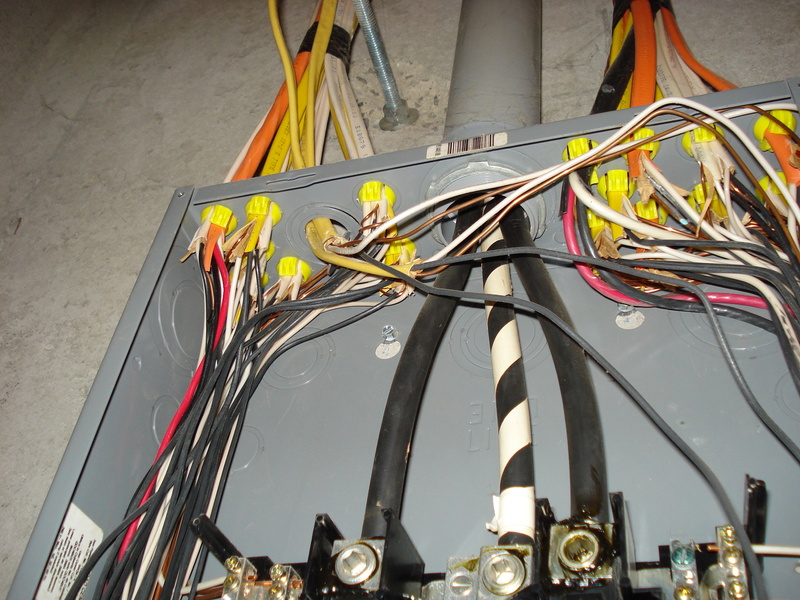 Here's an electrical panel that's hazardously wired with solid-core aluminum cables. These exposed wire connectors could easily dislodge, and exposed energized conductors. 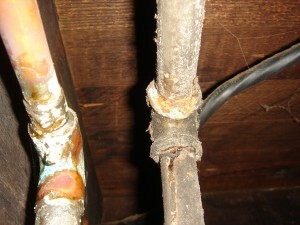 There is no strain-relief clamp on this wire where it enters a water heater. 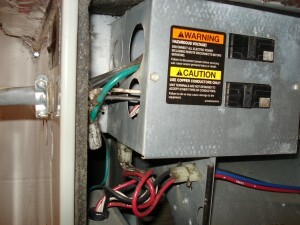 A child could easily pull the wire out of the heater, touch an energized conductor, and be electrocuted. 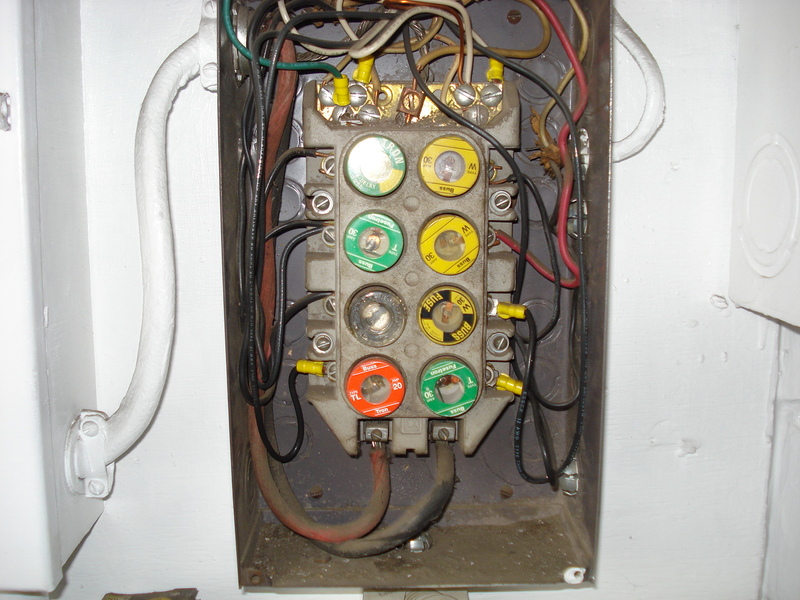 This is knob-and-tube wiring, which is antiquated, and which typically should be replaced. 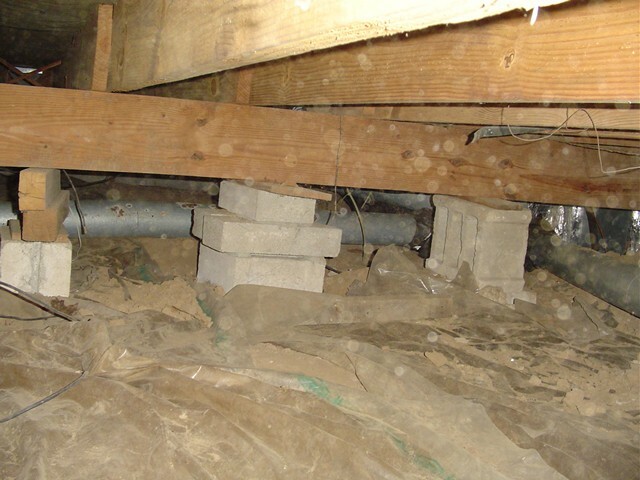 In this photo, you can see the ceramic tubes passing through the floor joist. 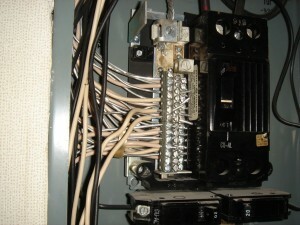 This is another photo of knob-and-tube wiring. 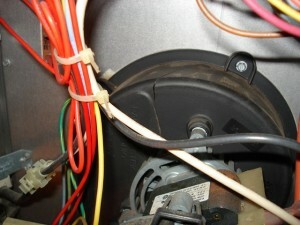 Here you can see the "knobs" that hold the individual wires in place. 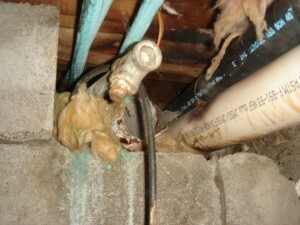 The conduit is detached beneath this power meter, and the service-entry cables are hazardously exposed. 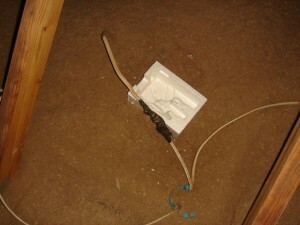 The white, neutral wire in the center of the photo has melted insulation due to a loose connection. 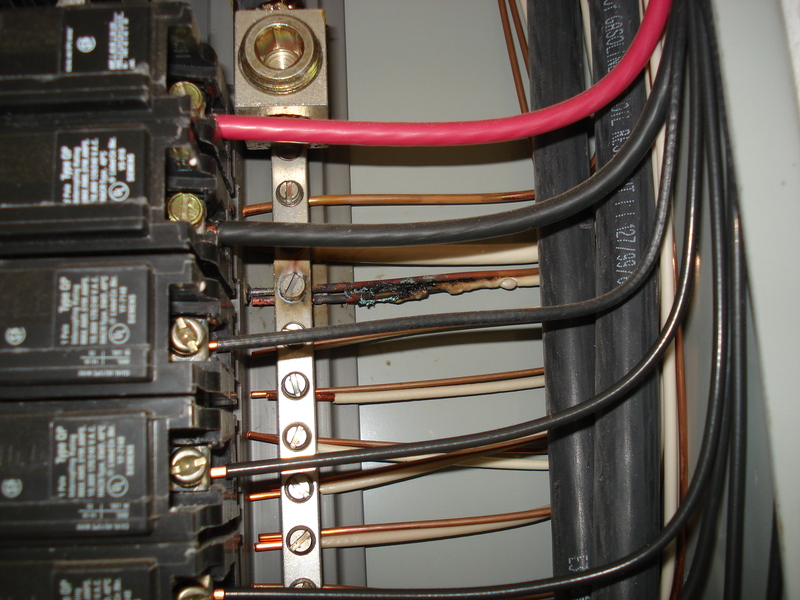 This can lead to arcing, and possibly a panel fire. 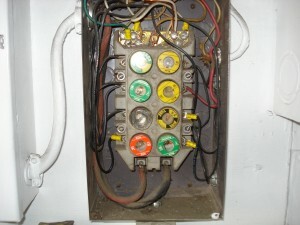 This is a Federal Pacific Stab-Lok electrical panel, which has proven hazardous in the past. 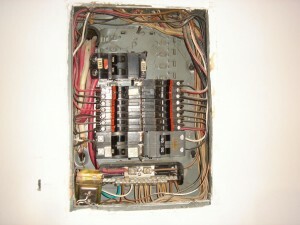 Most electricians recommend replacing these panels. 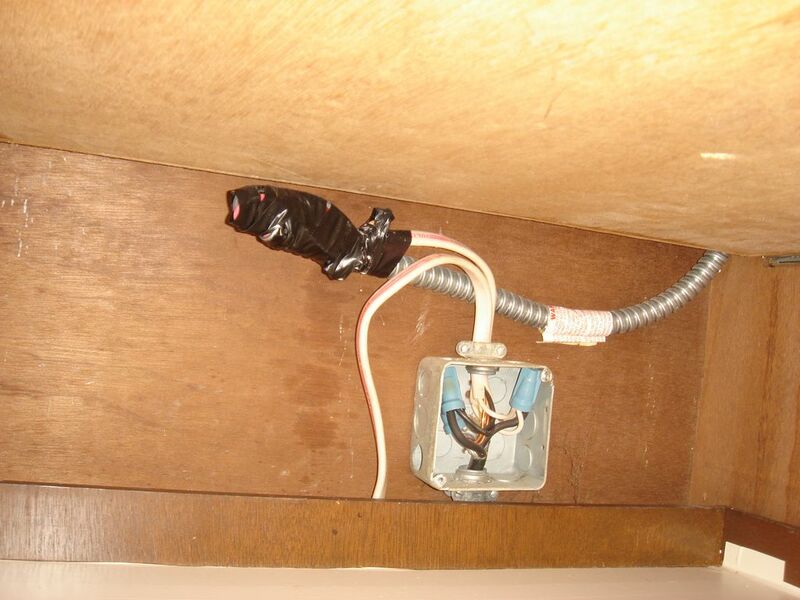 This hazardous wire splice and coverless junction box were lurking in a cabinet beneath an oven. 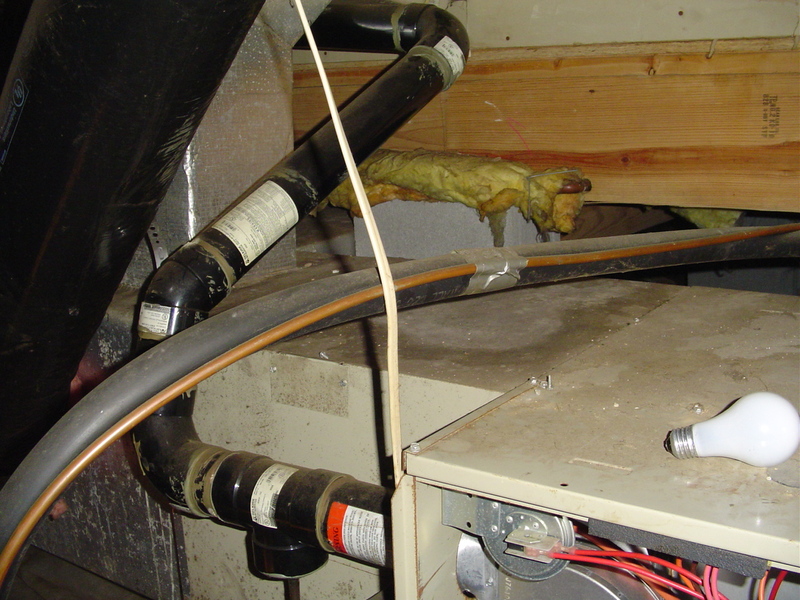 There are no strain-relief clamps on these wires installed within a heat pump. 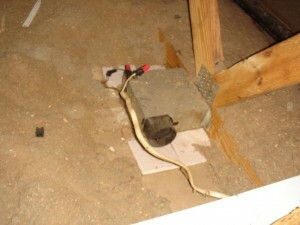 the sharp, vibrating edge of the connections box can damage the insulation on the wires and create a shock hazard. There is no strain-relief bushing to secure the wire in the upper gutter of this electrical panel, as required. 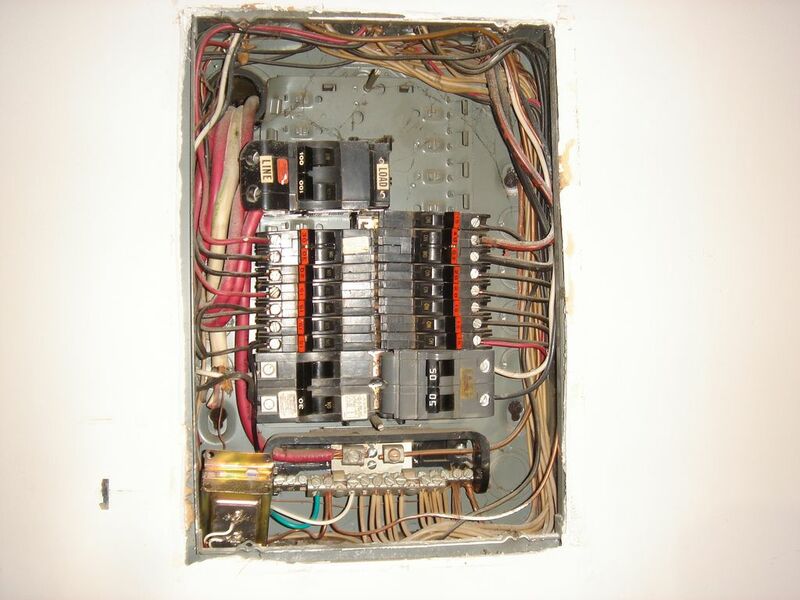 Fuseboxes are antiquated and should be replaced. 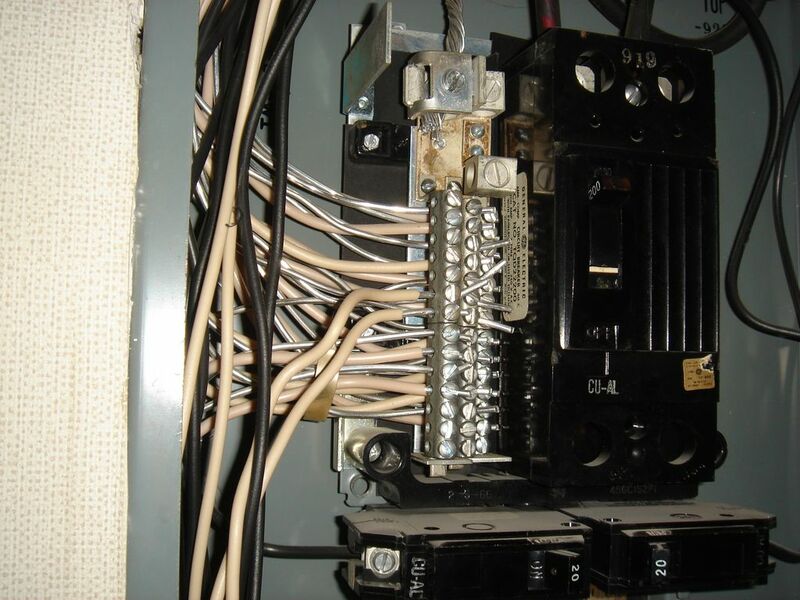 This fuse box contains multiple overfused circuits--which present fire hazards--and double-tapped circuits. 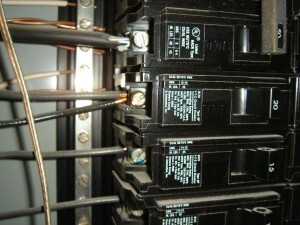 This circuit breaker is both double-tapped and overfused. 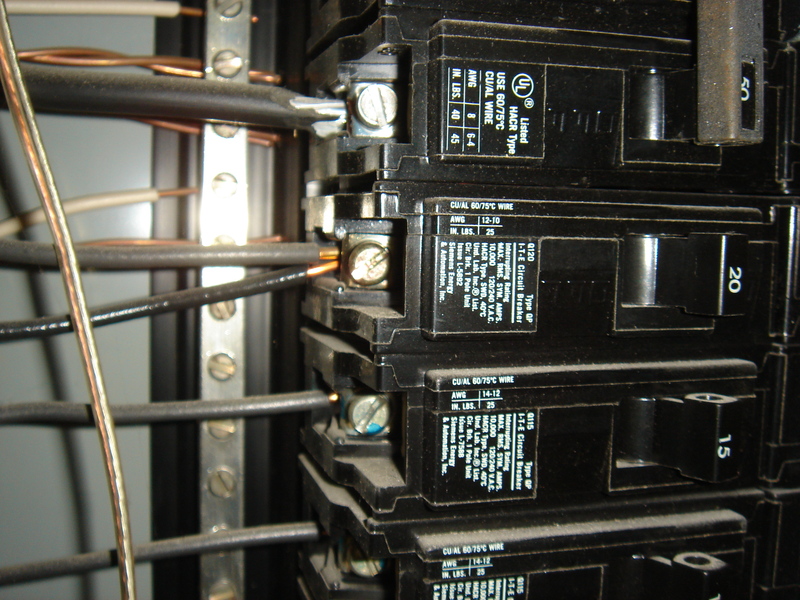 Two wires can't be placed beneath one breaker screw--with the exception of some Square D models--and 14-gauge wire is hazardously connected to a 20-ampere breaker. 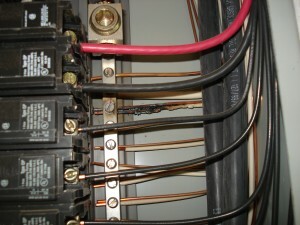 The wire could overheat and catch fire without tripping the breaker. 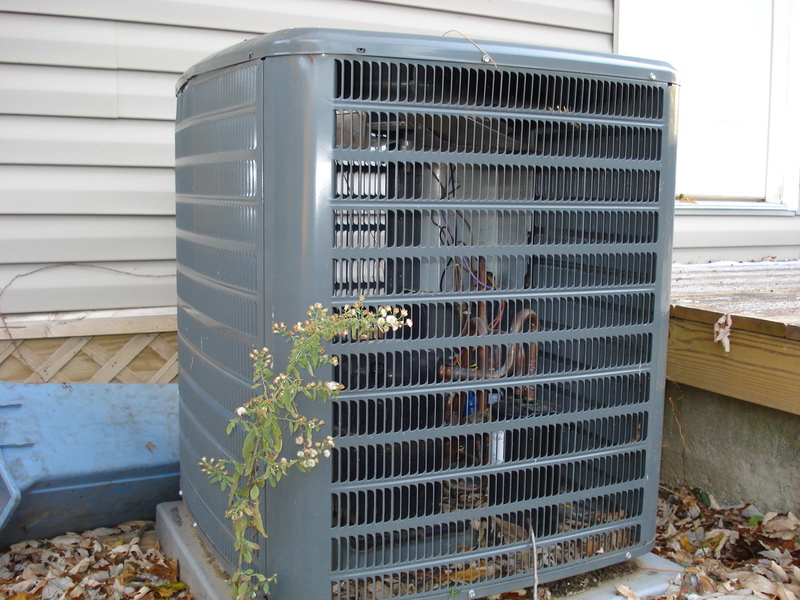 This evaporator coil--which is the counterpart of the exterior A/C or heat pump condenser--is clogged and won't function correctly. 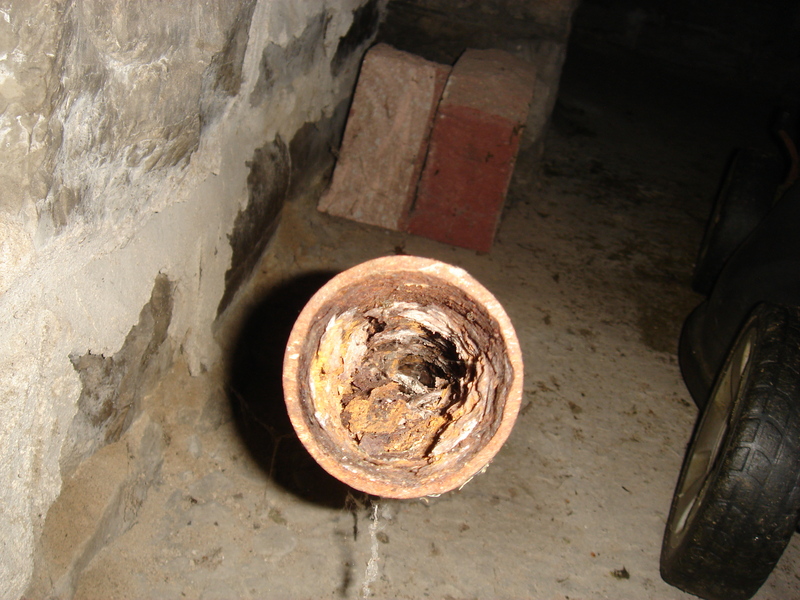 This furnace flue pipe is severely corroded and could allow combustion gases to enter the house. 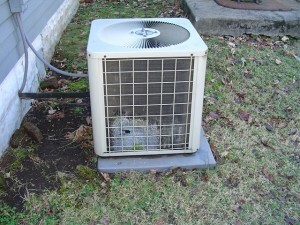 This A/C condenser has been damaged by dog urine and must be replaced. 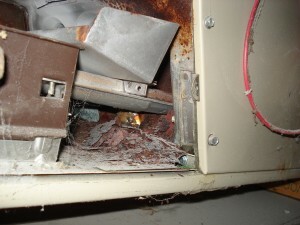 The draft-inducer fan housing in this furnace is cracked and must be replaced. 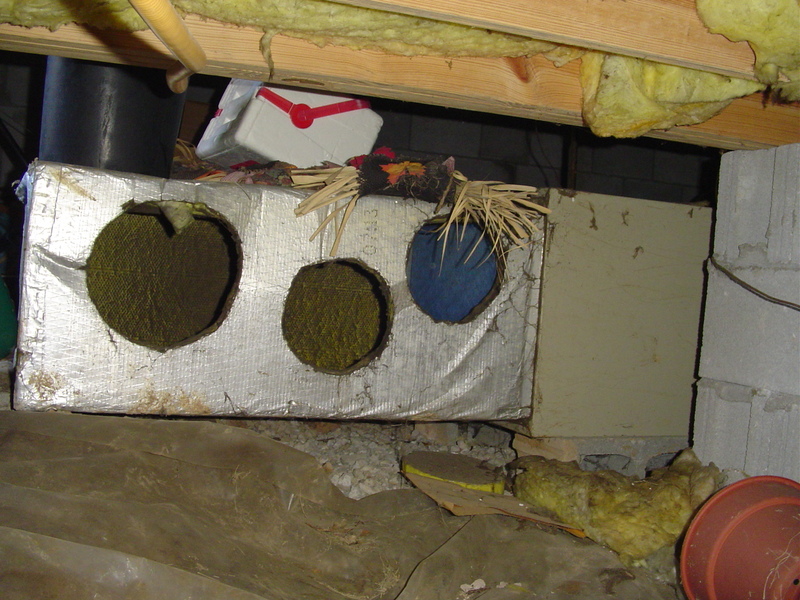 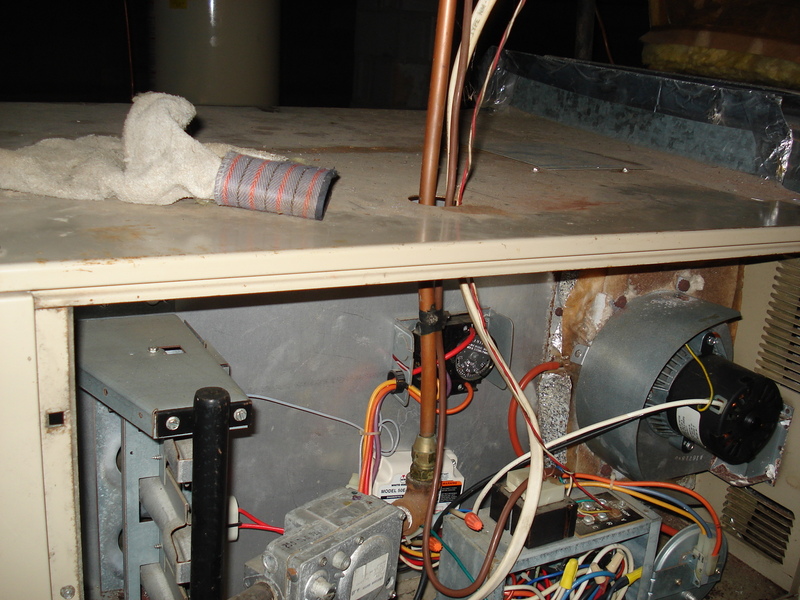 The primary and secondary condensate drains for this furnace are improperly teed together. 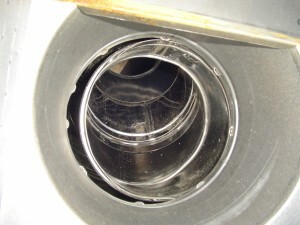 The secondary drain connected to the condensate-overflow pan is required to be dedicated, and to discharge in a conspicuous location. Here's another deteriorated furnace flue-pipe that could potentially allow combustion gases to asphyxiate the house's occupants. 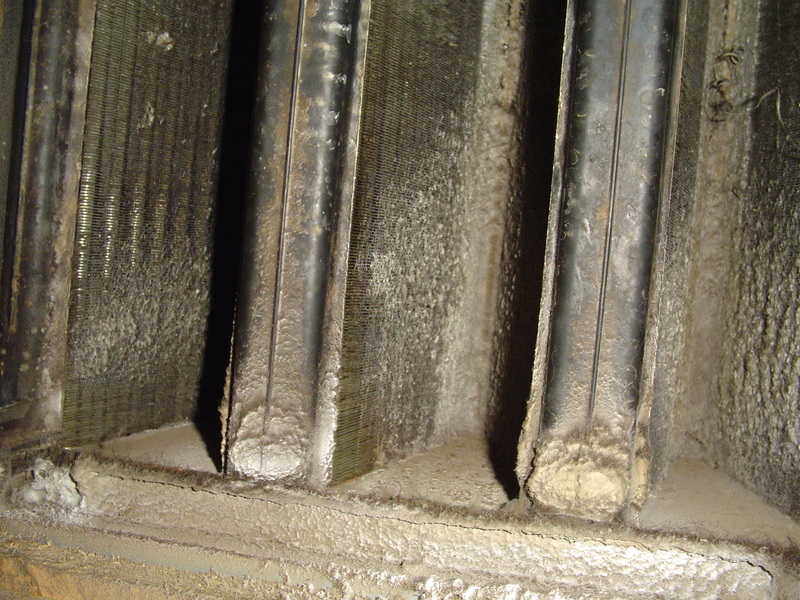 Here's another clogged evaporator coil. 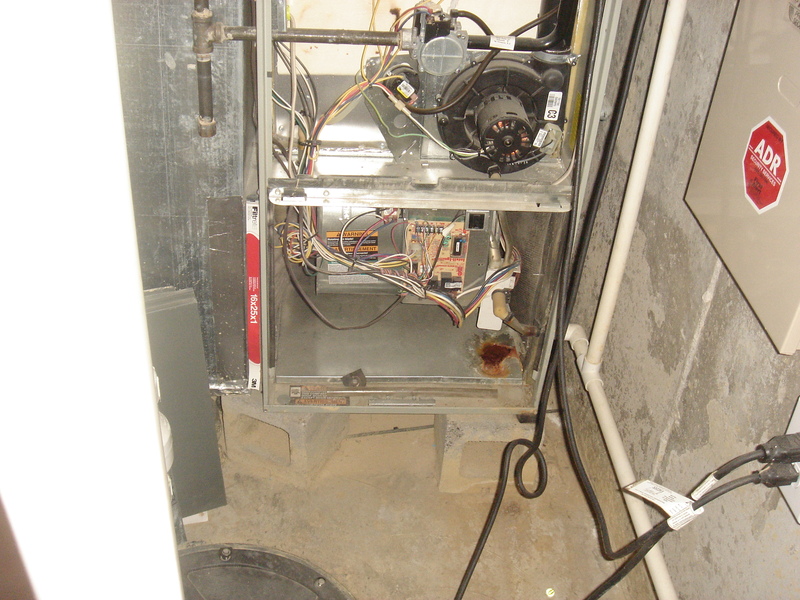 The system will not function correctly in its current condition. 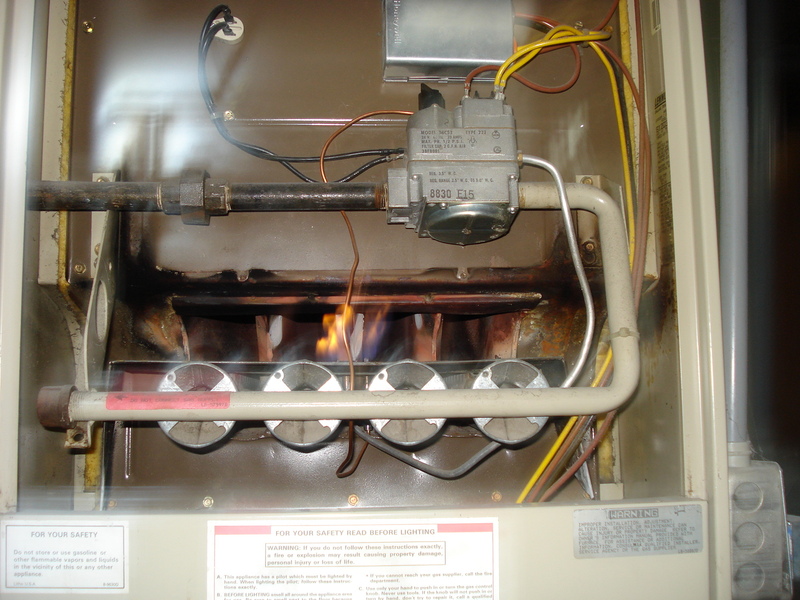 Both the primary and secondary drain lines furnace are clogged. 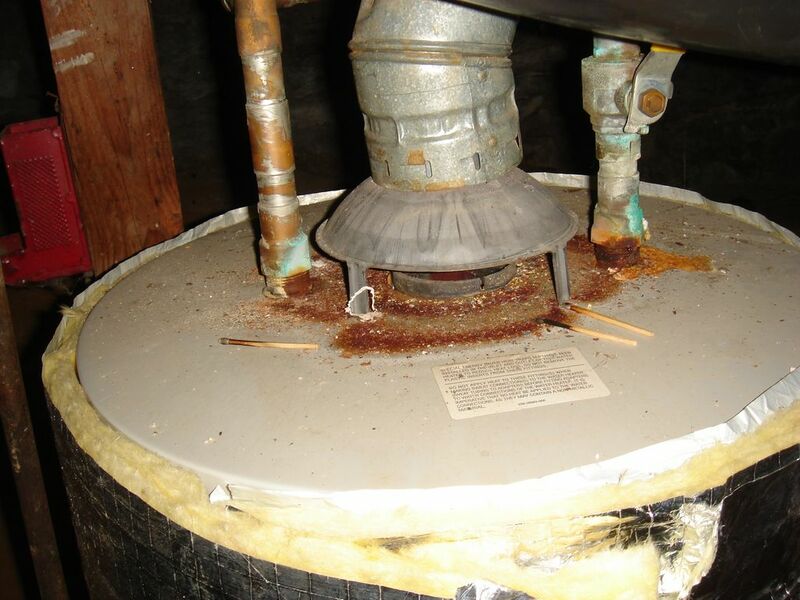 It's only a matter of time before the pan overflows and water damage occurs. 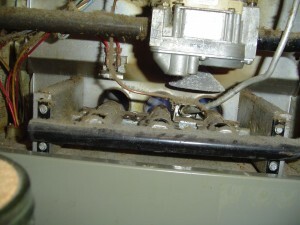 This furnace has a cracked heat-exchanger chamber, and must be replaced. 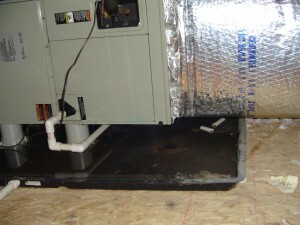 This furnace's blower is exceedingly clogged, which will dramatically decrease the system's efficiency. 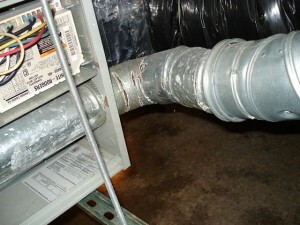 The intake and flue pipes were installed backwards on this furnace's horizontal vent termination. 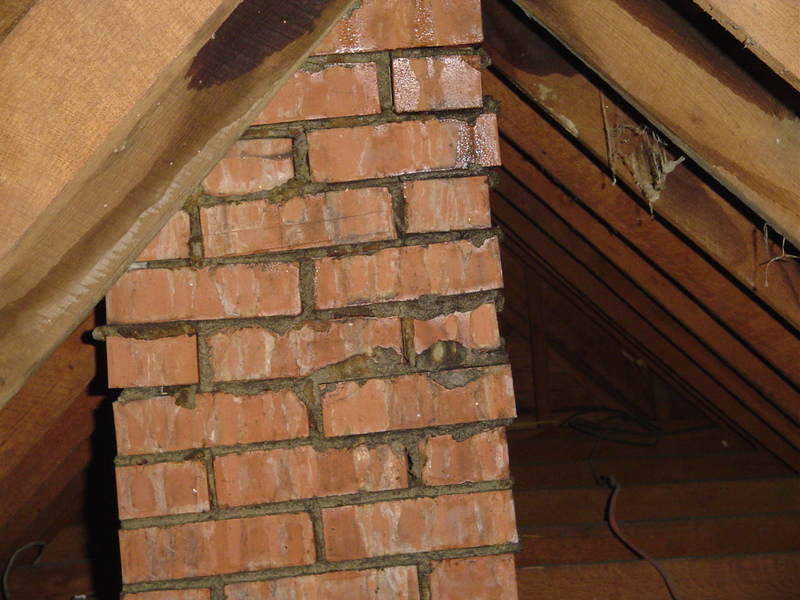 The flue gases were being absorbed by the brick veneer rather than discharging into the atmosphere. Gas appliances--like this furnace--aren't permitted to draw combustion air from bathrooms. Also, there is a return-air register within ten feet of the furnace, which isn't allowed. 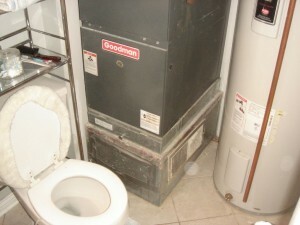 Columbia Gas would red-tag this furnace if observed. 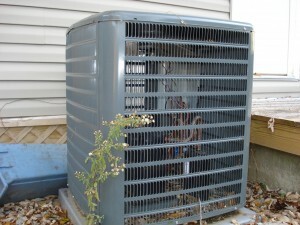 Thieves stole the copper tubing from this A/C condenser. The interior of this furnace was so packed with dust and lint, that the far left burner was clogged and inoperable. This gas-line coupling isn't permitted within furnaces because the couplings are prone to leak. 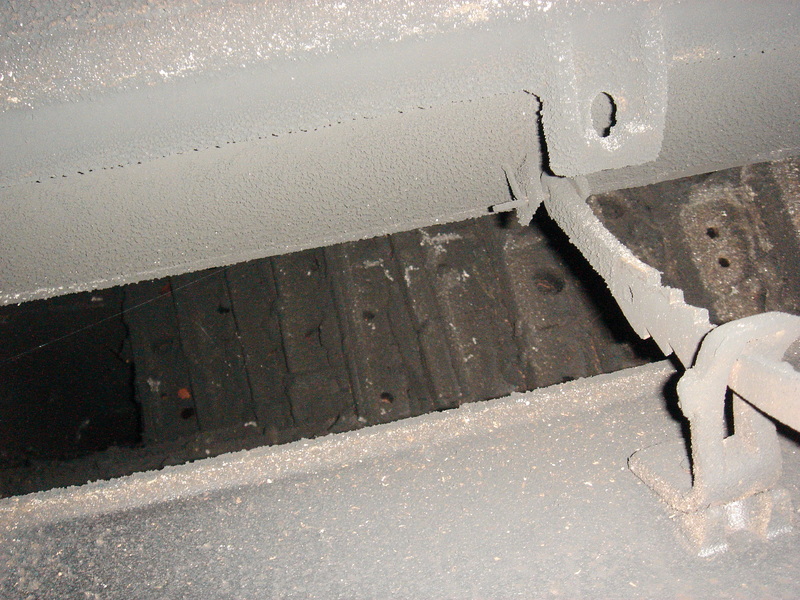 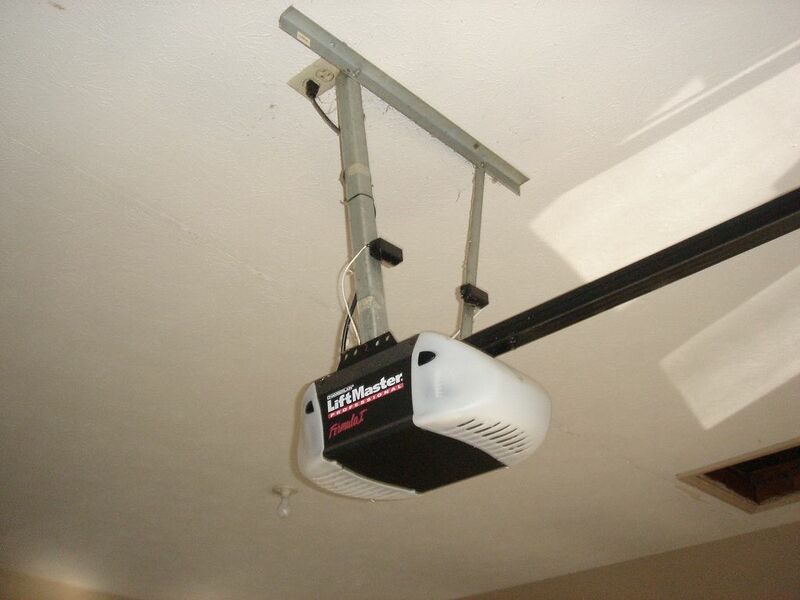 Furnaces operate MUCH more efficiently when they have ductwork attached. 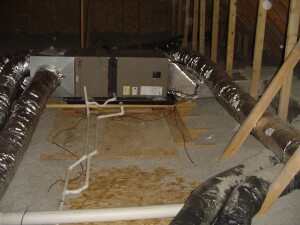 This furnace was heating a crawlspace due to the missing ducts. 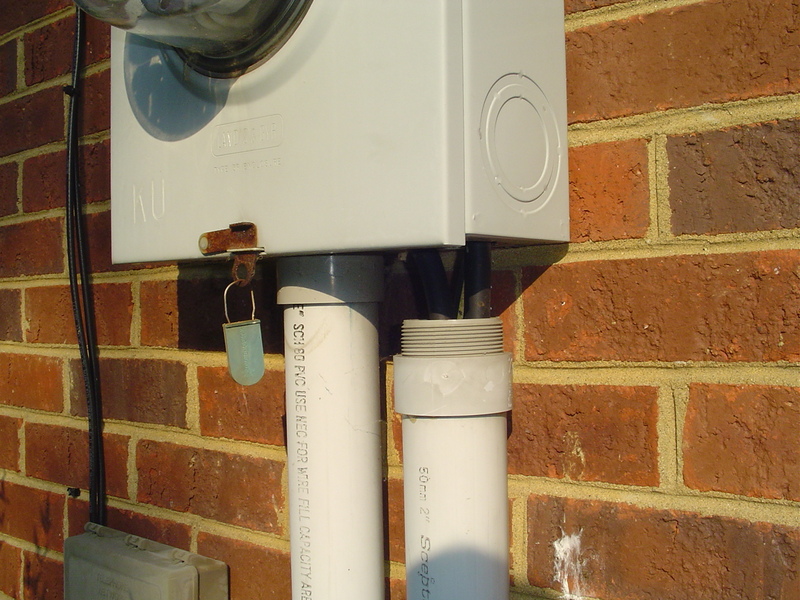 This HTPV flue-pipe was the subject of a recall because the couplings often failed and allowed flue gas seepage into houses. 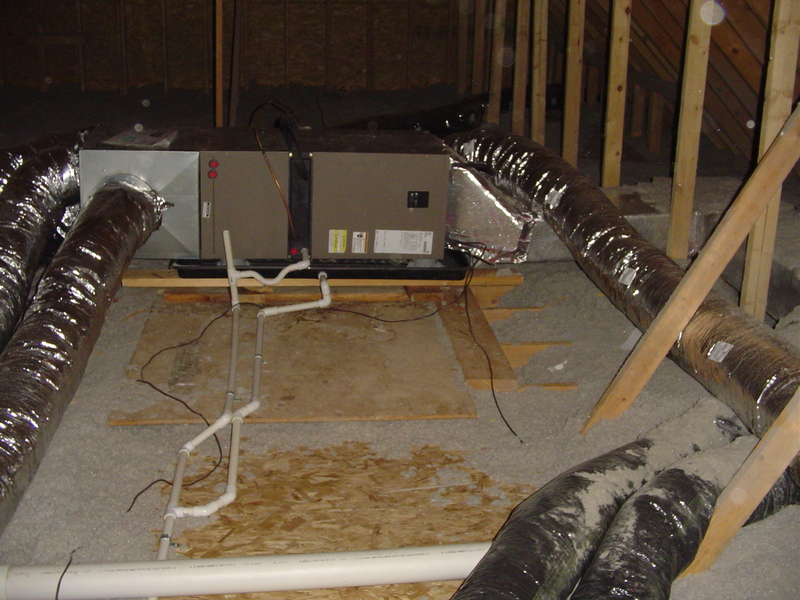 A/C condensate drains must discharge to the exteriors of houses, and not dump several gallons of water onto crawlspace floors. 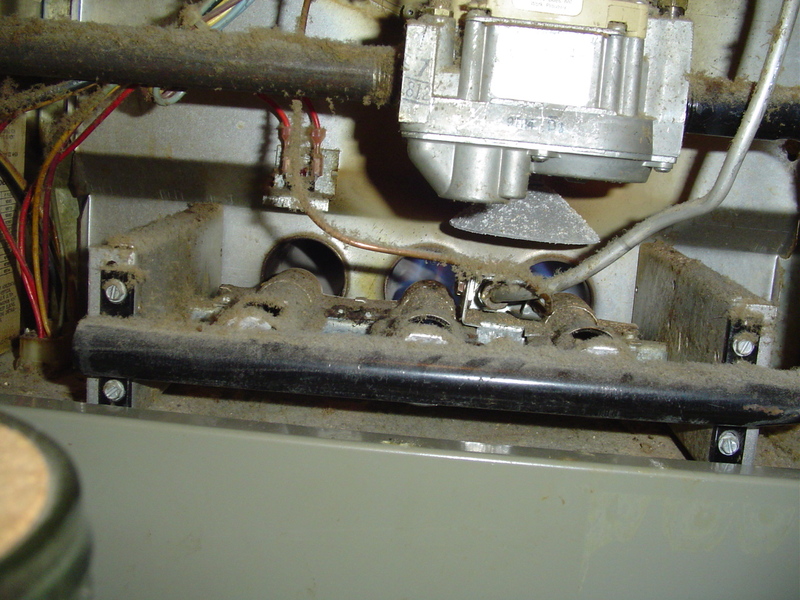 The face-plate on this furnace's heat exchanger is cracked and must be replaced. Soft copper gas-lines are not permitted to be installed through furnace cabinets. 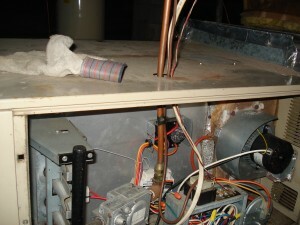 The sharp, vibrating edge of the cabinet can cut though the copper and cause a house to be flooded with natural gas. 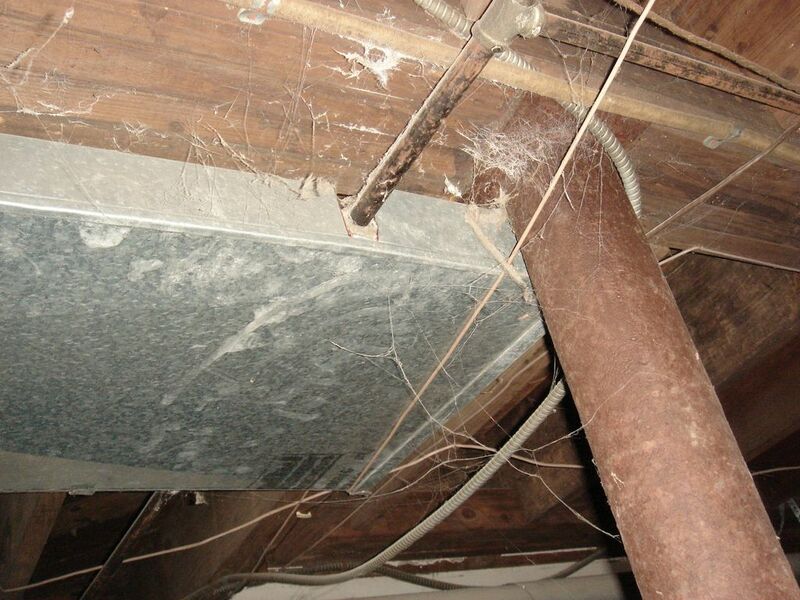 Gas-supply lines are not permitted to be installed within HVAC ductwork, because if the line were ever to be compromised, gas would be distributed throughout the house. 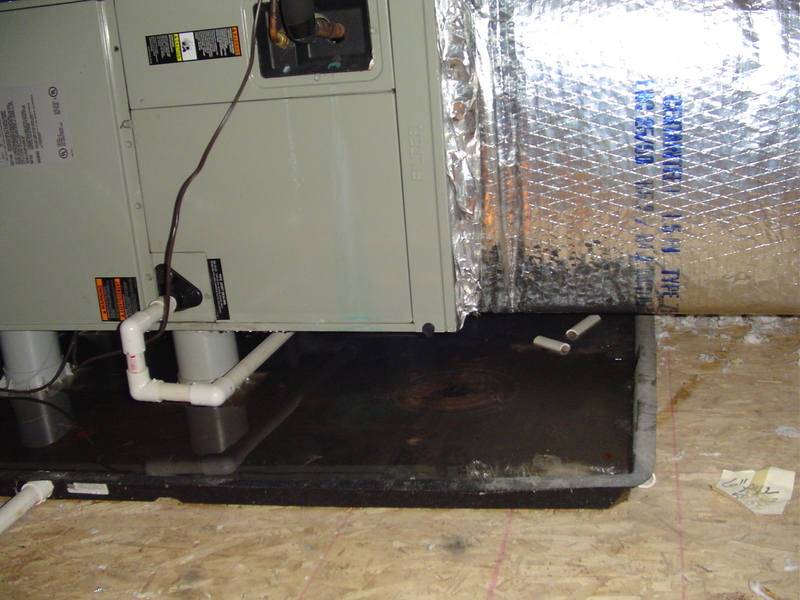 This furnace's internal condensate-drain is leaking. 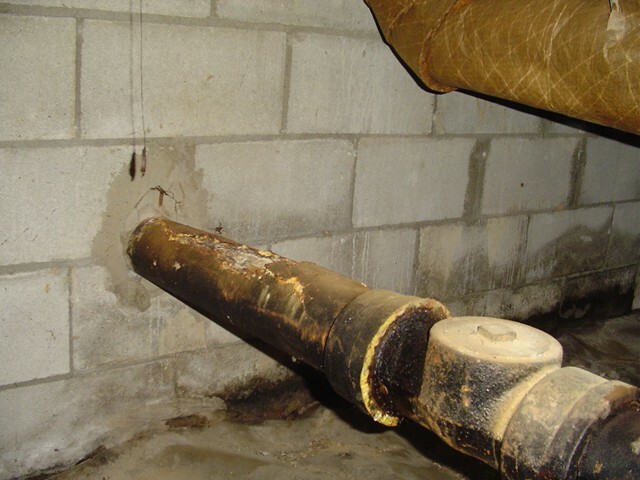 As an oh-by-the-way, the perpendicular section of gas piping is a sediment trap. 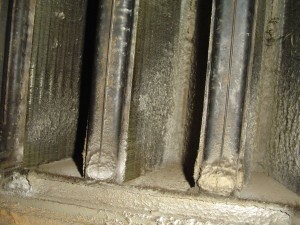 The sediment trap prevents debris in the line from entering the furnace's burners. 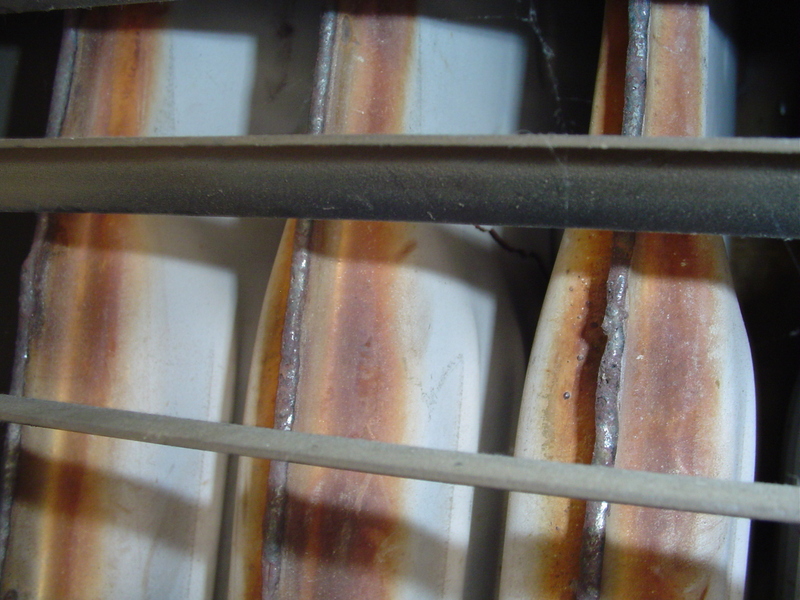 This heat exchanger was so deteriorated, the individual chambers were packed with rust flecks. 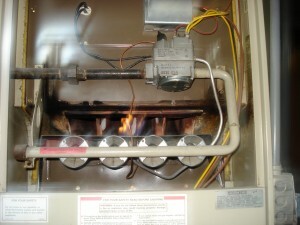 The furnace had to be replaced. 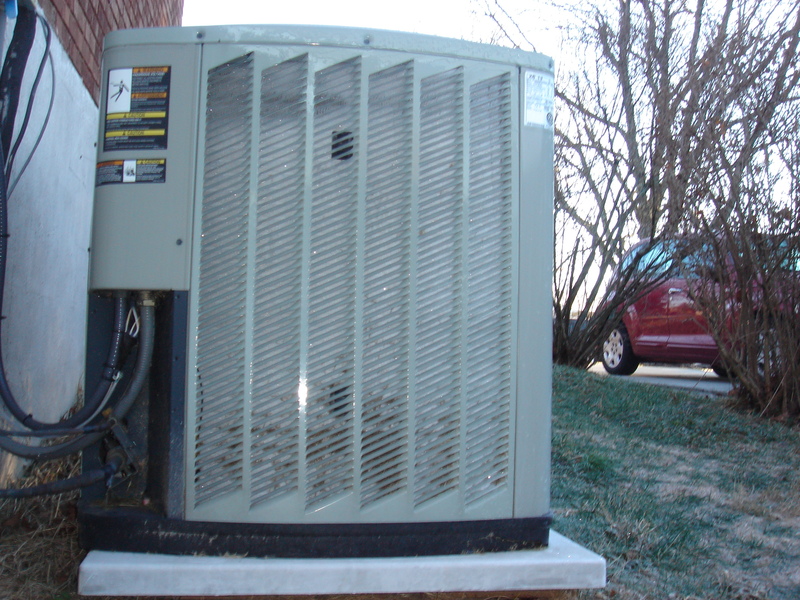 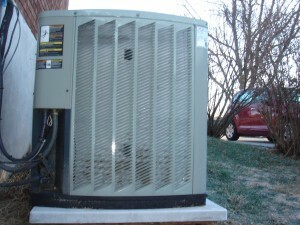 This A/C system is incorrectly charged, and the condenser and evaporator coil are icing over. 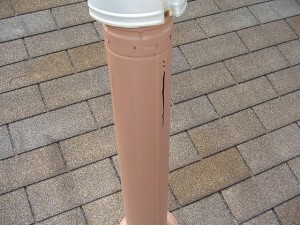 Think there might be a leakage problem associated with this sewer vent? 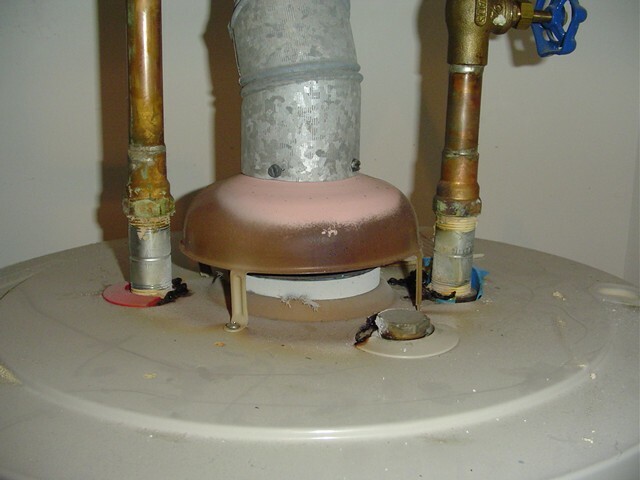 This water heater isn't drafting its flue gases correctly. The plastic trim rings beneath the inlet and outlet pipes are melted due to the flue gases backdrafting into the house. 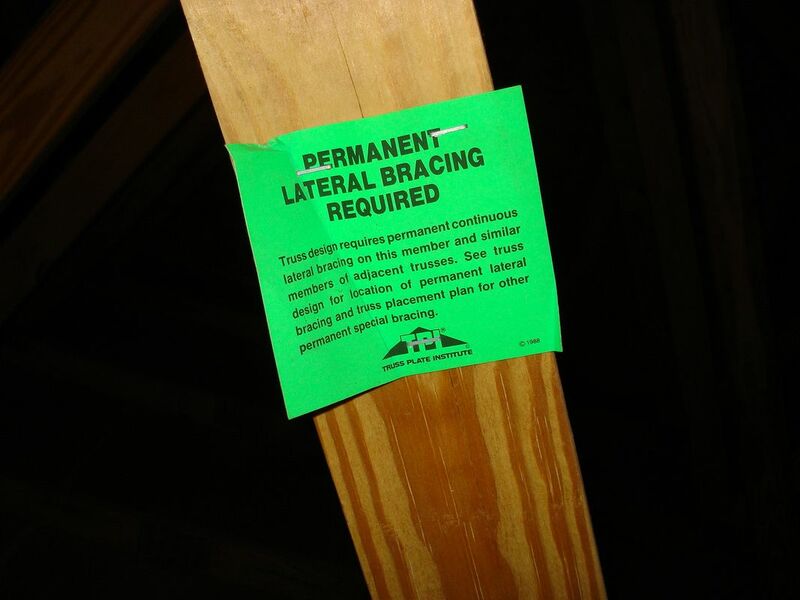 This is a potentially lethal condition. 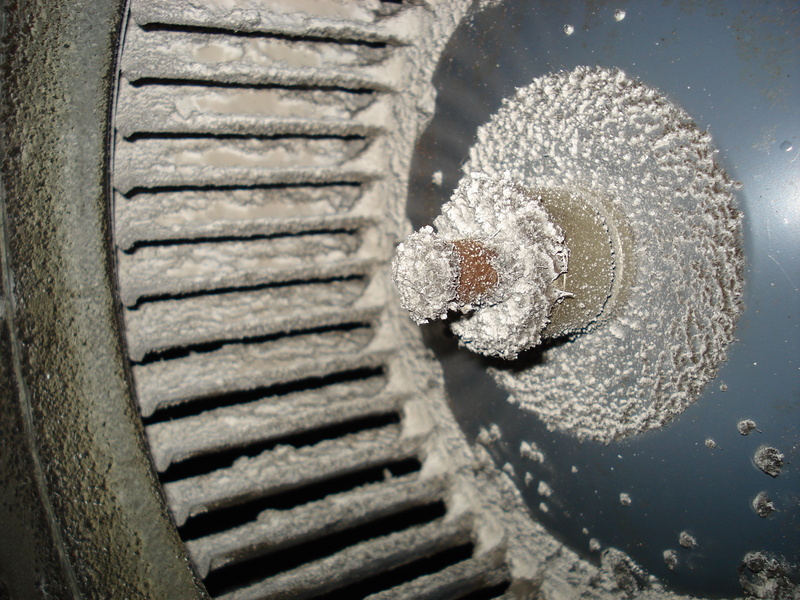 This dishwasher air-gap is clogged. 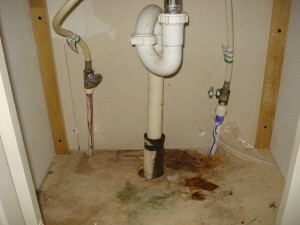 This sink drain isn't vented correctly, and it also contains an illegal "S" trap. 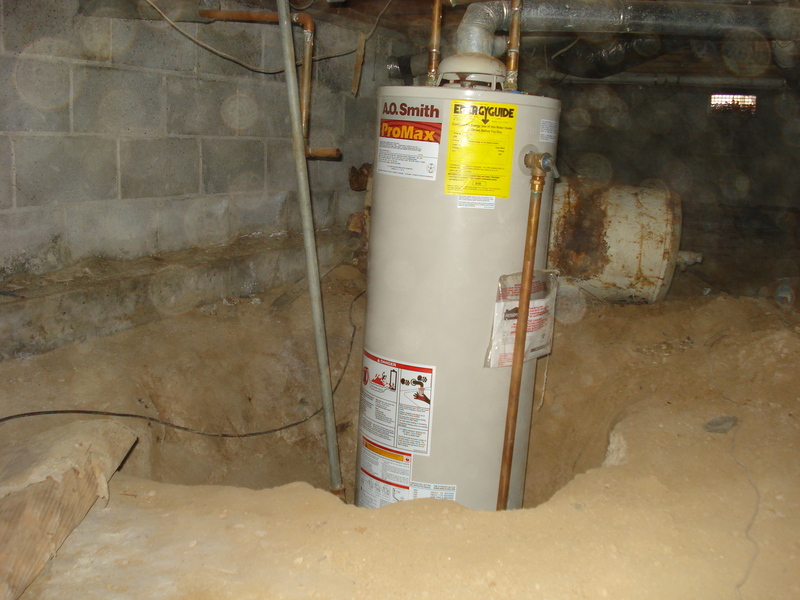 This water heater flue-pipe was hazardously discharging directly into a crawlspace, a potentially lethal condition. 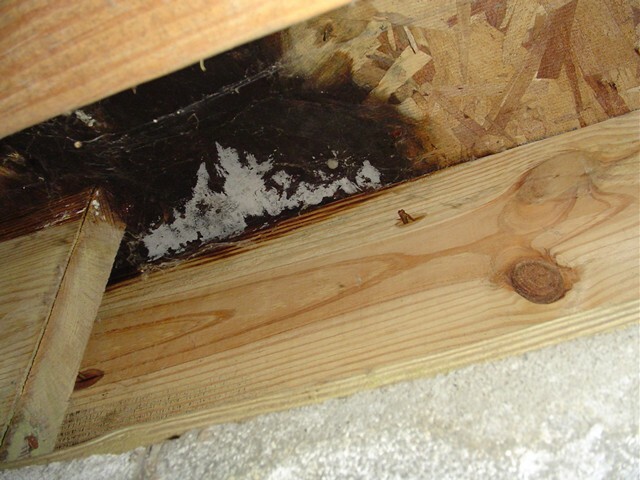 Note the charred PVC waste line and floor joist. 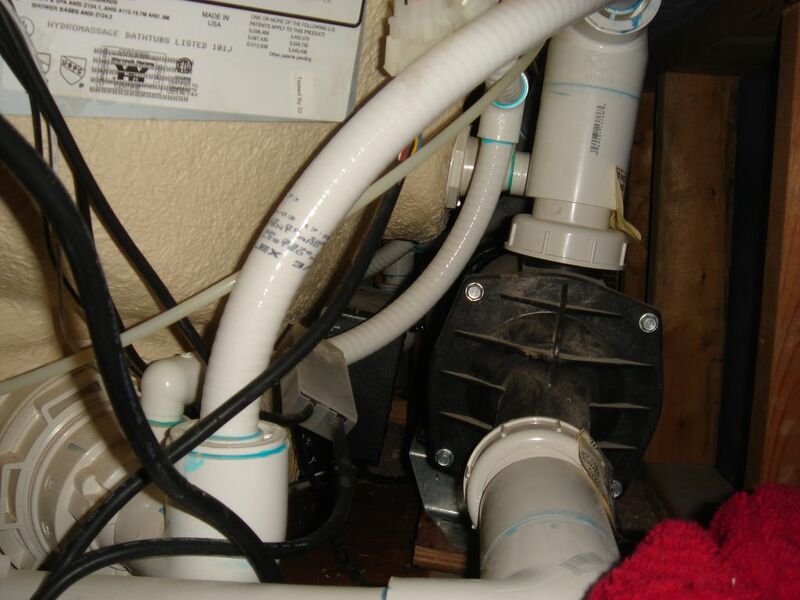 The tubing for this whirlpool tub was leaking, though it wasn't apparent within the ceiling beneath the tub. Here's another backdrafting water heater. 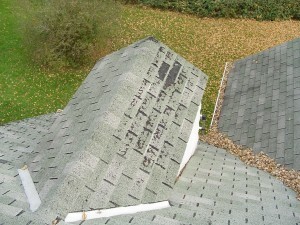 This is a highly dangerous condition. Galvanized pipes corrode internally and become occluded, which decreases water pressure and flow. 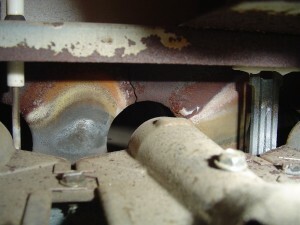 The couplings also are prone to corrosion and leakage, like the right coupling in the photo. 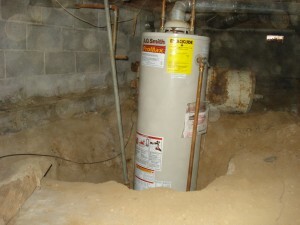 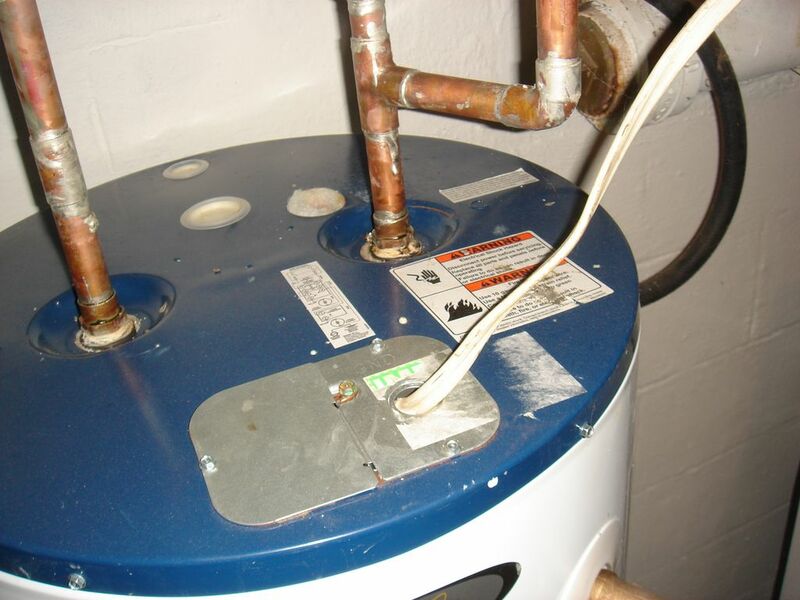 Water heaters are NOT supposed to be installed below grade. This is another angle of the water heater to the left. Pretty dopey, yes? 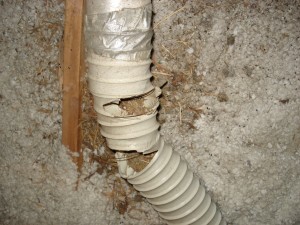 This waste line is cracked and must be replaced. Galvanized and cast-iron drains corrode internally and eventually require replacement. This cast-iron drain is nearly completely clogged. 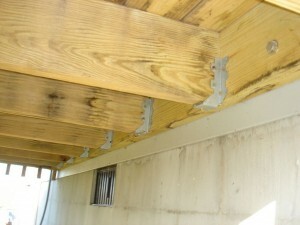 Ledger boards for decks MUST be appropriately flashed where they attach to houses. Anchoring the ledger board through vinyl siding, like the deck in the photo, will cause the house's framing to become water damaged, and also perhaps allow the deck to detach from the house. 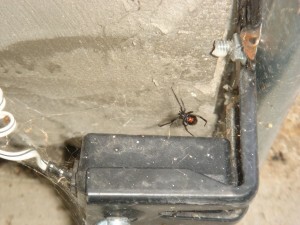 I'm not certified to perform pest inspections, but I will let you know if I discover any black widow spiders hanging out in your new house. 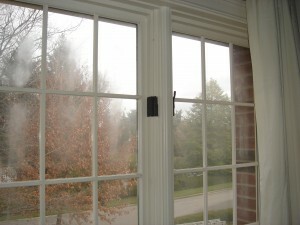 These windows have lost the airtight seals between their panes of glass. You can see the anhydrous salts trapped between the individual panes. 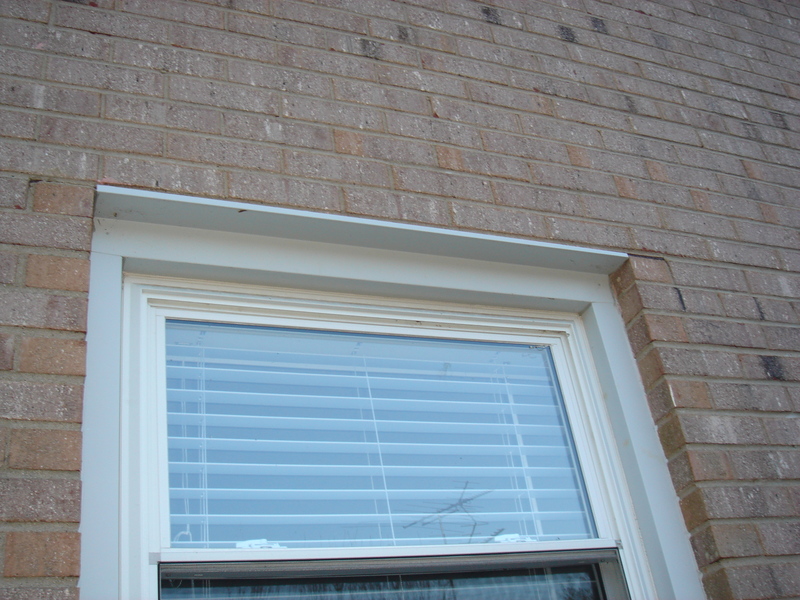 When this window was replaced, the installer improperly wrapped the lintel--the steel angle that supports the brick veneer above the window--with aluminum trim coil. 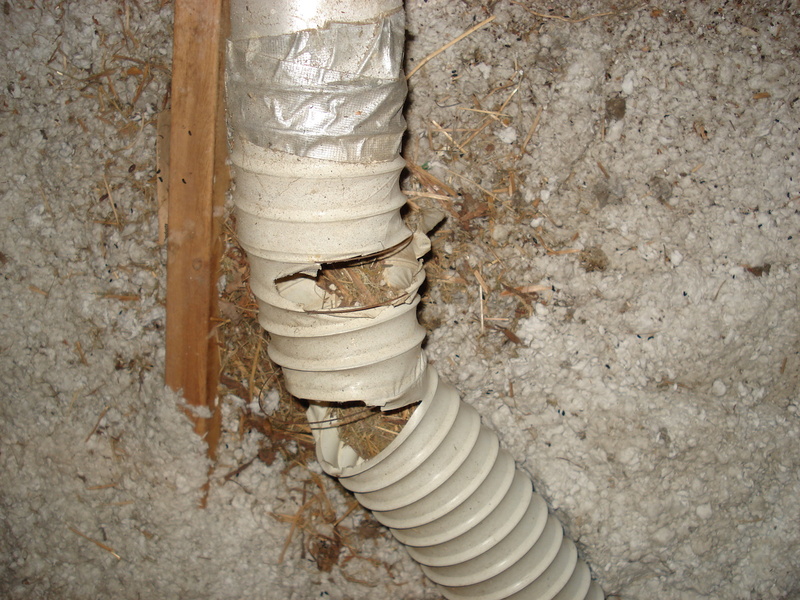 The trim coil will hold moisture, prevent drainage, and cause the lintel to prematurely rust and deteriorate. 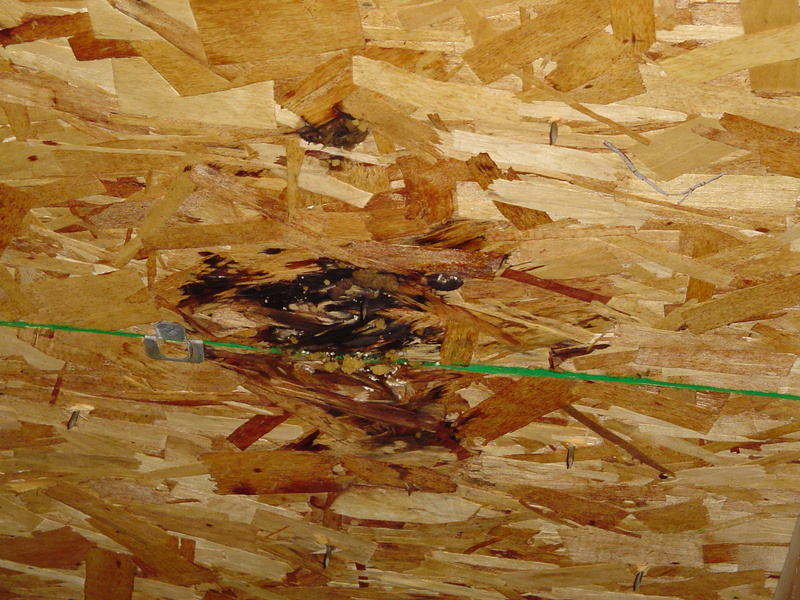 Head-flashings are necessary to prevent water damage to wall framing and sheathing. 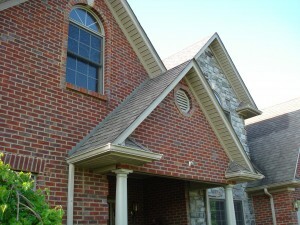 In this photo, there is head-flashing above the door on the right, but none above the window to the left. 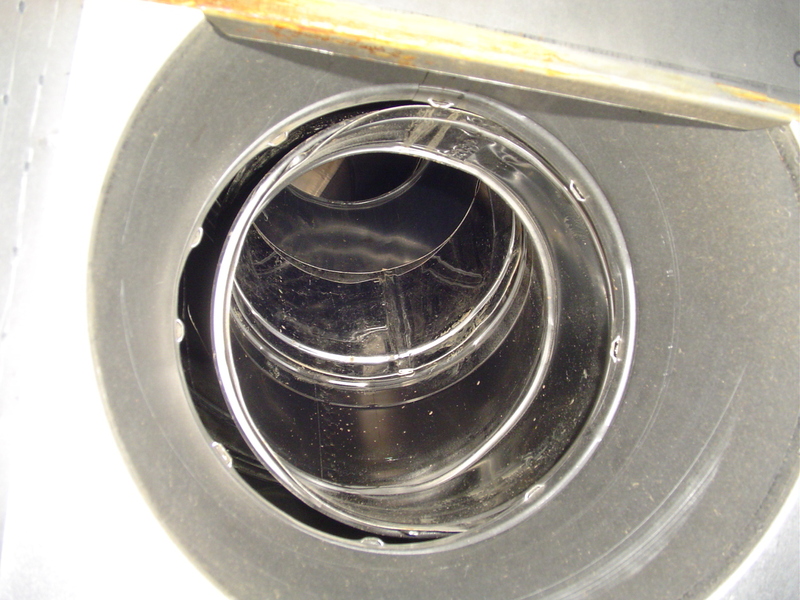 I check all accessible clothes-dryer ducts. 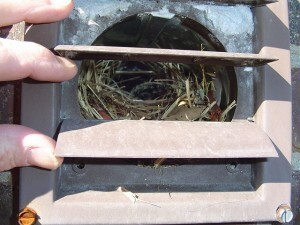 Many contain clogs, like this one that birds had tried to nest within. 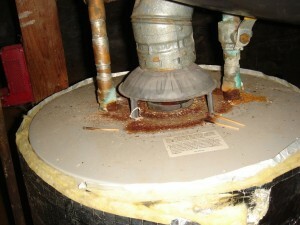 Bathroom fans should discharge to the exteriors of houses. There's mold and mildew on the roof decking in this photo due to an improperly configured fan. This roof leak around a chimney wasn't evident when the roof was walked, which is why it's crucial for an inspector to check out as much of an attic as is possible. 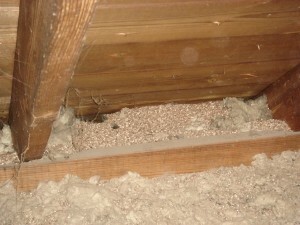 Vermiculite insulation was mined in Libby, Montana. 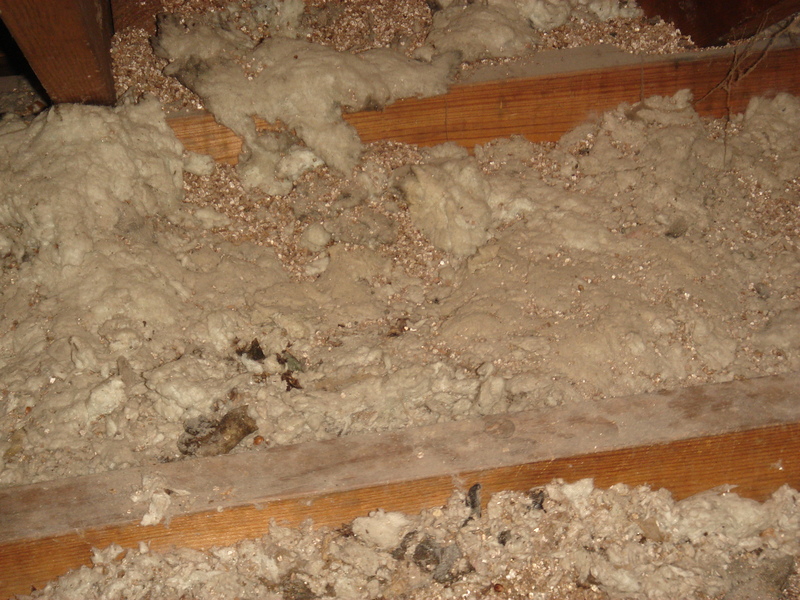 Vermiculite often contains asbestos, and mitigation is expensive. 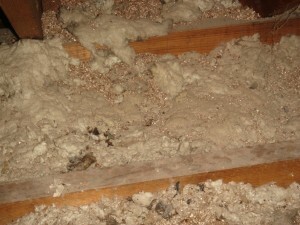 This is another look at vermiculite insulation. This gable louver is completely blocked by nesting birds. This plastic clothes-dryer duct--which is not permitted--has been destroyed by nesting birds. 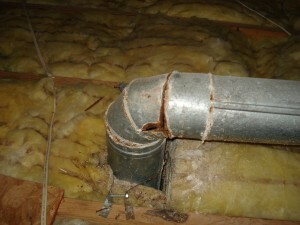 Here's another leak that wasn't evident when the roof was walked. 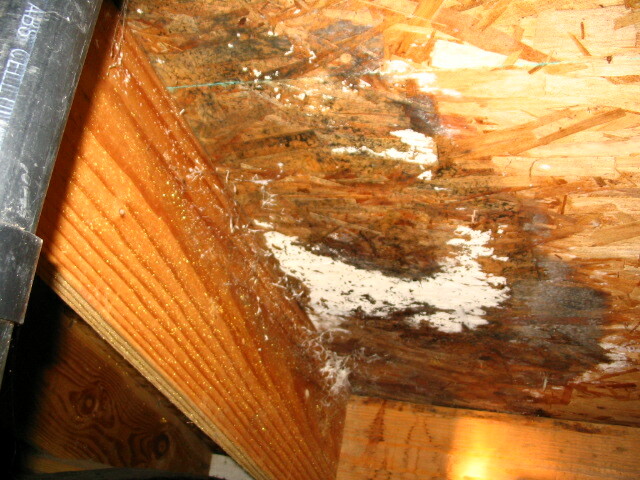 The roof decking in this attic contains a patina of mold and mildew due to inadequate ventilation. 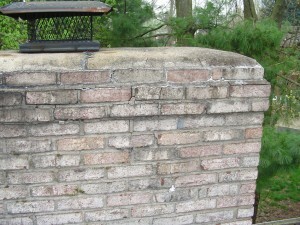 The open-core bricks in the throat of this fireplace are hazardous, and they also violate NFPA guidelines. 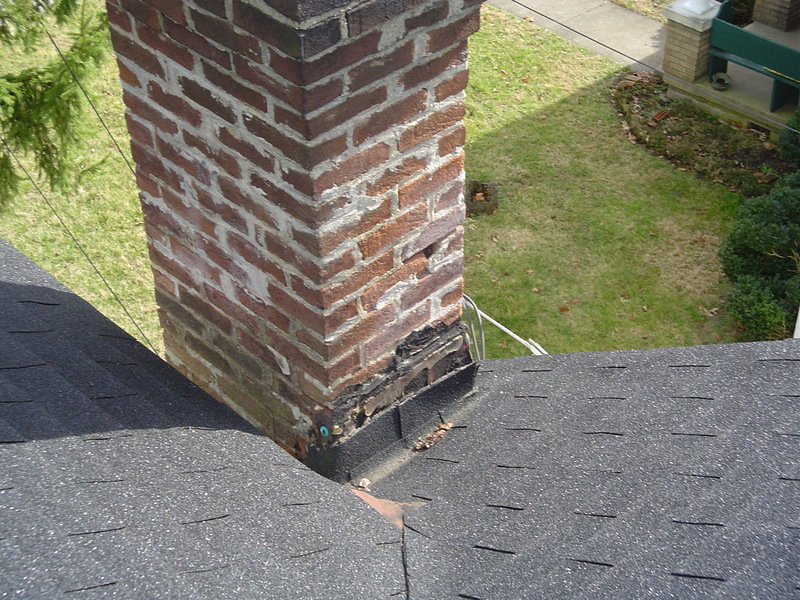 Creosote can build up in the cores, and increase the likelihood of a chimney fire. The flue above this pre-fab fireplace was completely separated from the firebox. 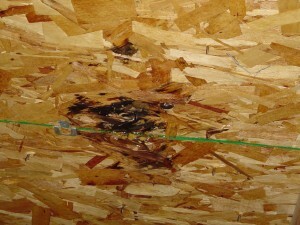 The homeowners are fortunate the house didn't catch fire. This cracked cap is allowing rainwater to seep into the chimney and damage the bricks beneath it. 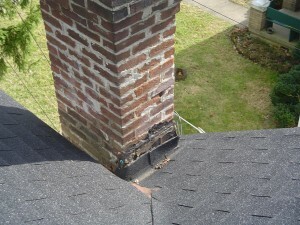 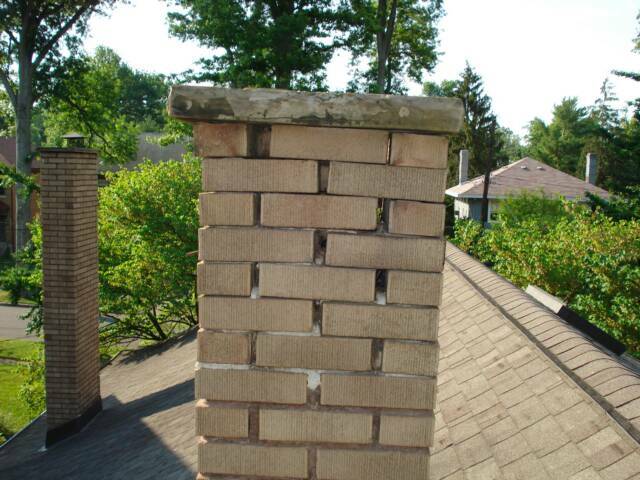 This deteriorated chimney requires partial reconstruction. 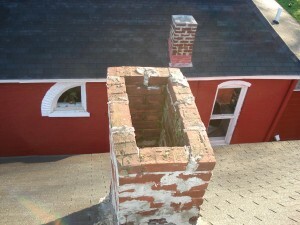 This chimney isn't flashed, and water is seeping into the attic portion beneath it. 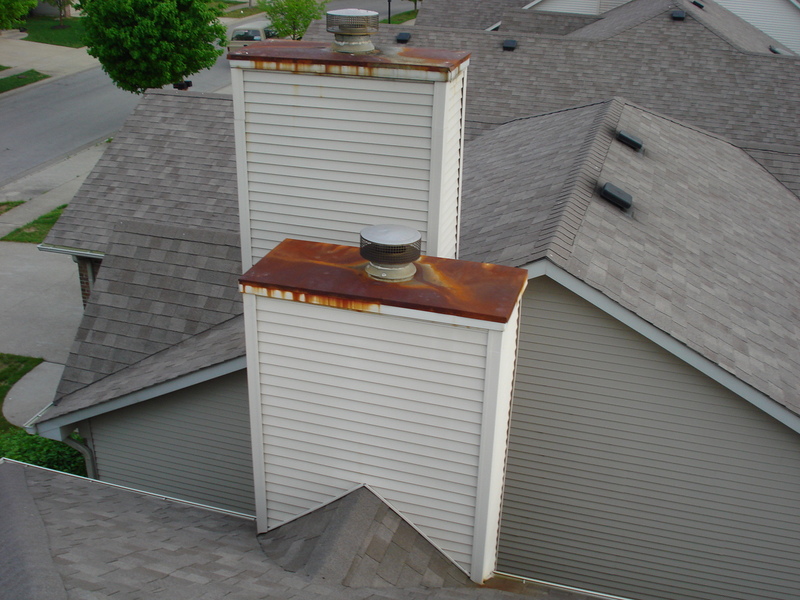 Water seepage through the cap is damaging this chimney.